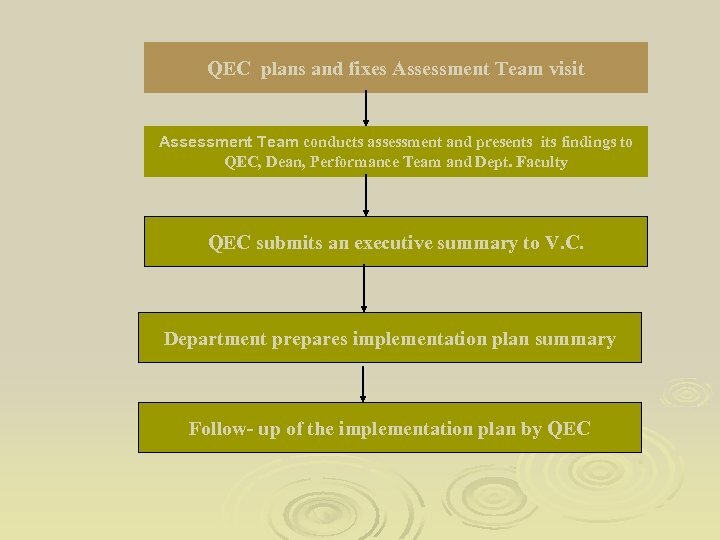 BRIEF BACKGROUND 2003 Ø Proposal was sent to Ministry of S & T to include QMD in NQP 2004 Ø First draft of NQP includes QMD with Rs. 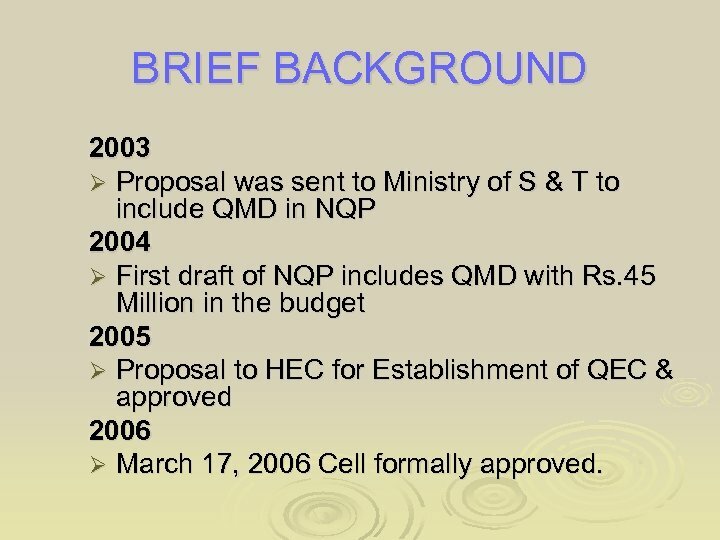 45 Million in the budget 2005 Ø Proposal to HEC for Establishment of QEC & approved 2006 Ø March 17, 2006 Cell formally approved. 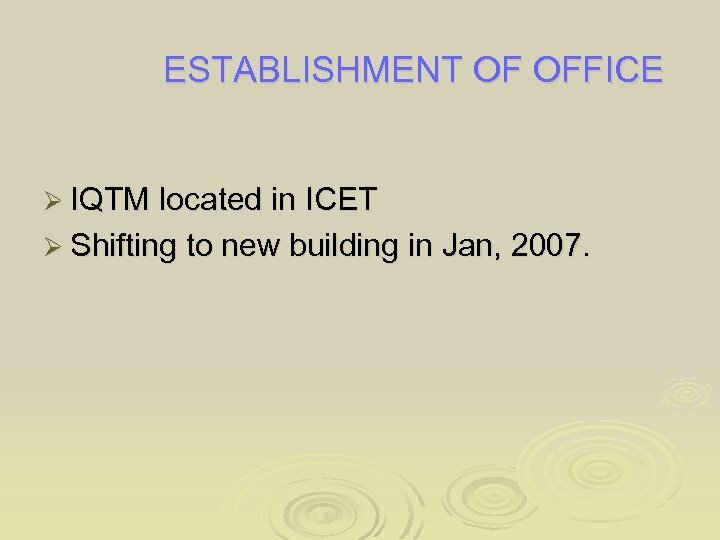 ESTABLISHMENT OF OFFICE Ø IQTM located in ICET Ø Shifting to new building in Jan, 2007. 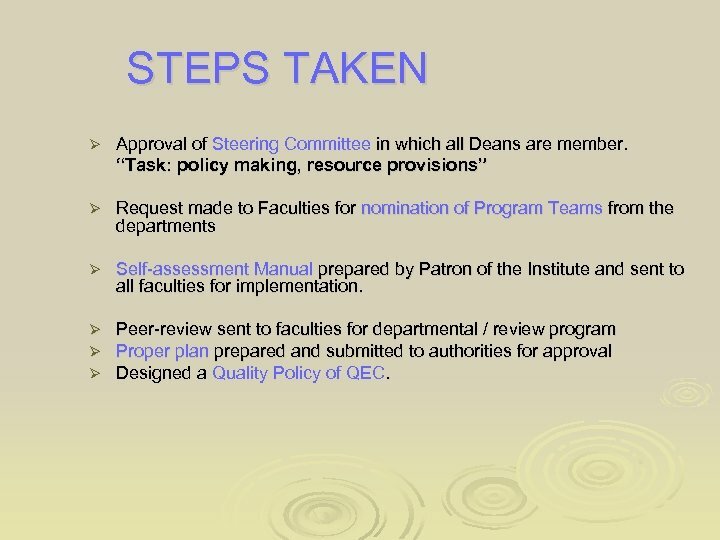 STEPS TAKEN Ø Approval of Steering Committee in which all Deans are member. “Task: policy making, resource provisions” Ø Request made to Faculties for nomination of Program Teams from the departments Ø Self-assessment Manual prepared by Patron of the Institute and sent to all faculties for implementation. 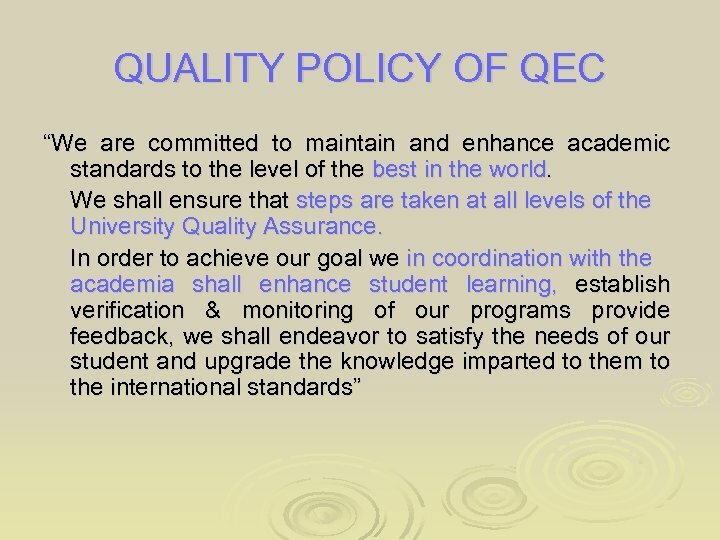 Ø Ø Ø Peer-review sent to faculties for departmental / review program Proper plan prepared and submitted to authorities for approval Designed a Quality Policy of QEC. 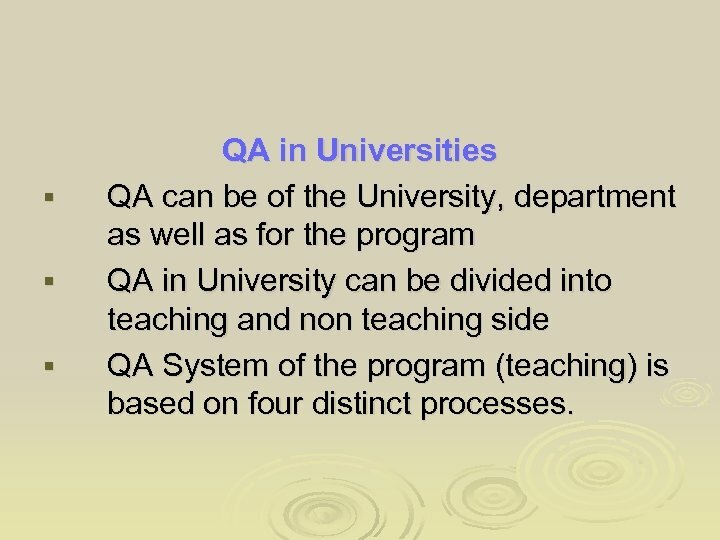 § § § QA in Universities QA can be of the University, department as well as for the program QA in University can be divided into teaching and non teaching side QA System of the program (teaching) is based on four distinct processes. 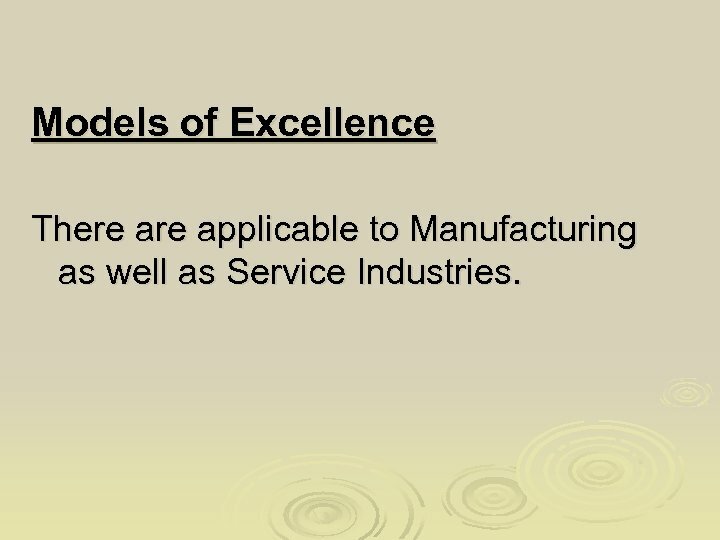 Models of Excellence There applicable to Manufacturing as well as Service Industries. 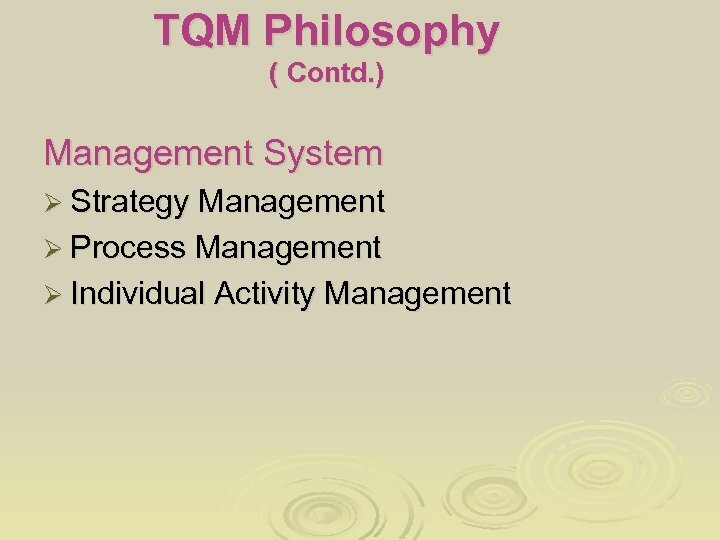 TQM Philosophy ( Contd. ) 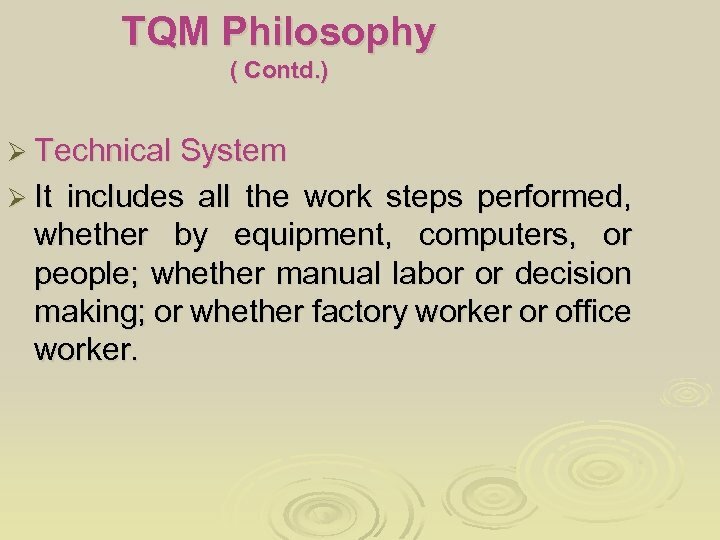 Ø Technical System Ø It includes all the work steps performed, whether by equipment, computers, or people; whether manual labor or decision making; or whether factory worker or office worker. 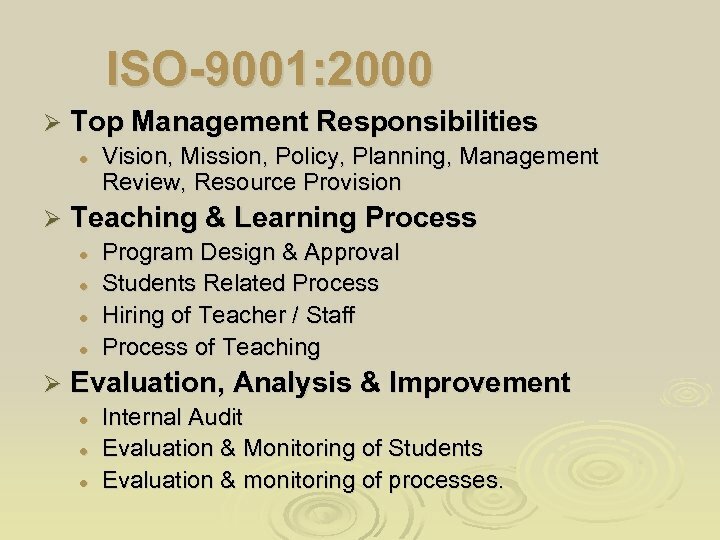 ISO-9001: 2000 Ø Top Management Responsibilities l Ø Teaching & Learning Process l l Ø Vision, Mission, Policy, Planning, Management Review, Resource Provision Program Design & Approval Students Related Process Hiring of Teacher / Staff Process of Teaching Evaluation, Analysis & Improvement l l l Internal Audit Evaluation & Monitoring of Students Evaluation & monitoring of processes. 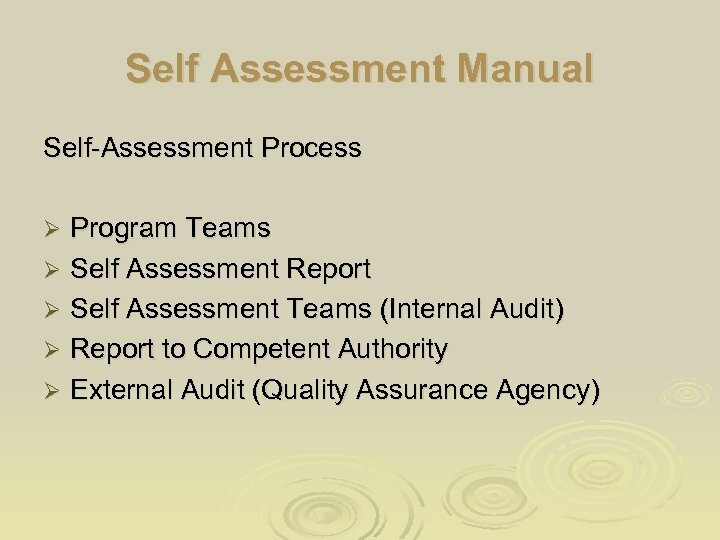 Self Assessment § Self assessment is an assessment conducted by the institution to assess whether programs meet their educational objectives and outcomes with the purpose to improve program’s quality and enhancing students learning. 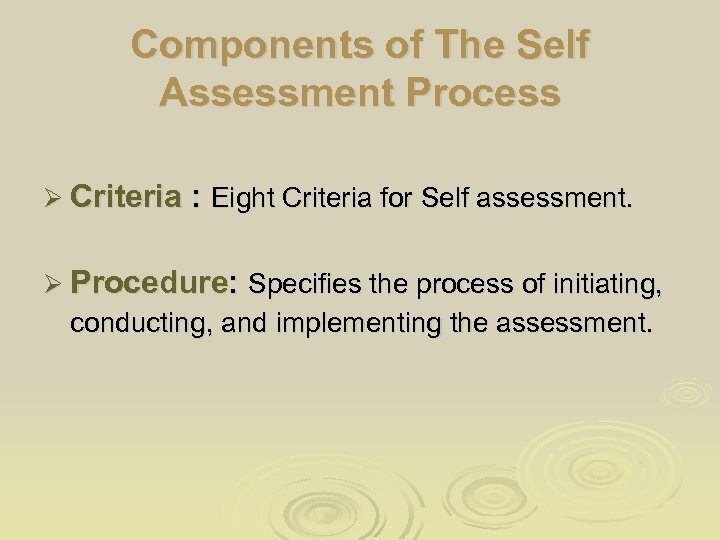 Components of The Self Assessment Process Ø Criteria : Eight Criteria for Self assessment. 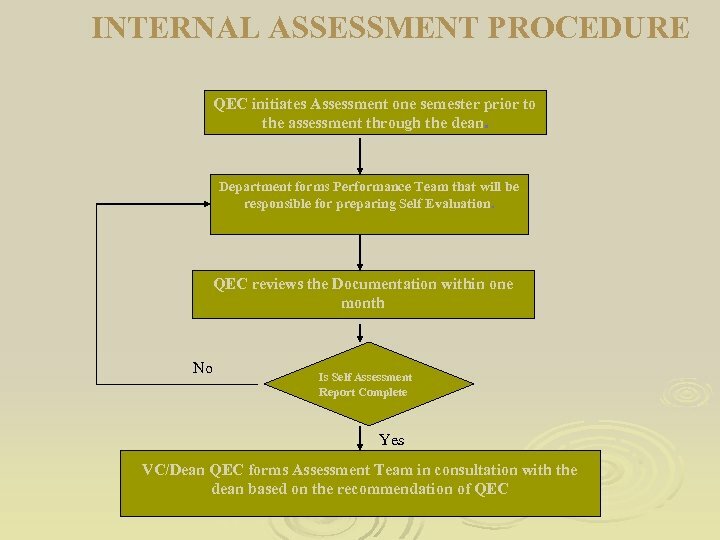 Ø Procedure: Specifies the process of initiating, conducting, and implementing the assessment. 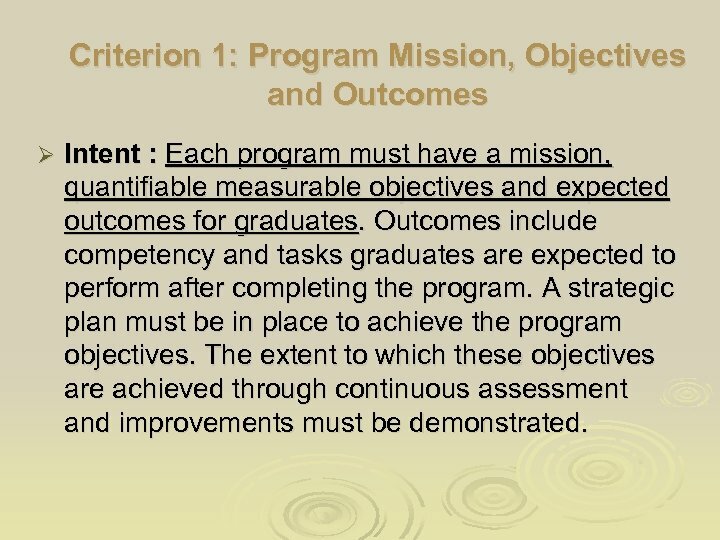 Criterion 1: Program Mission, Objectives and Outcomes Ø Intent : Each program must have a mission, quantifiable measurable objectives and expected outcomes for graduates. 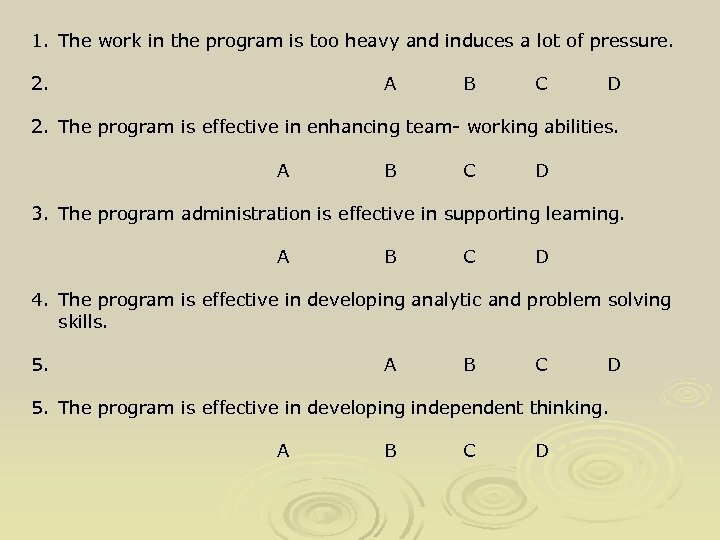 Outcomes include competency and tasks graduates are expected to perform after completing the program. A strategic plan must be in place to achieve the program objectives. 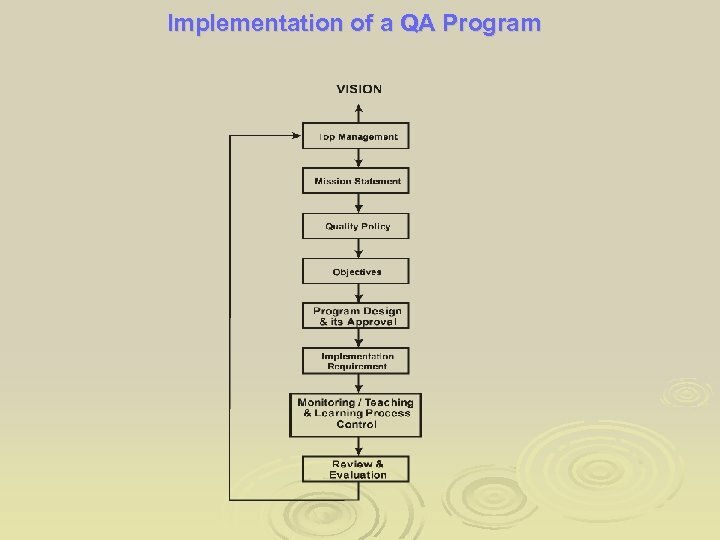 The extent to which these objectives are achieved through continuous assessment and improvements must be demonstrated. 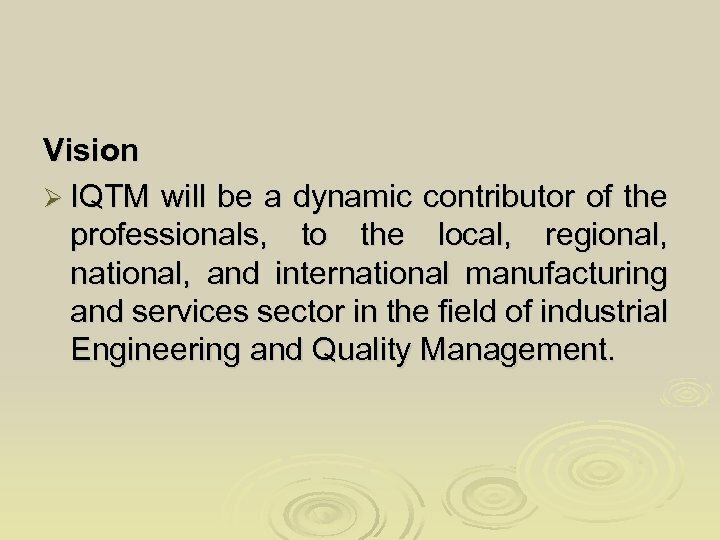 Vision Ø IQTM will be a dynamic contributor of the professionals, to the local, regional, national, and international manufacturing and services sector in the field of industrial Engineering and Quality Management. 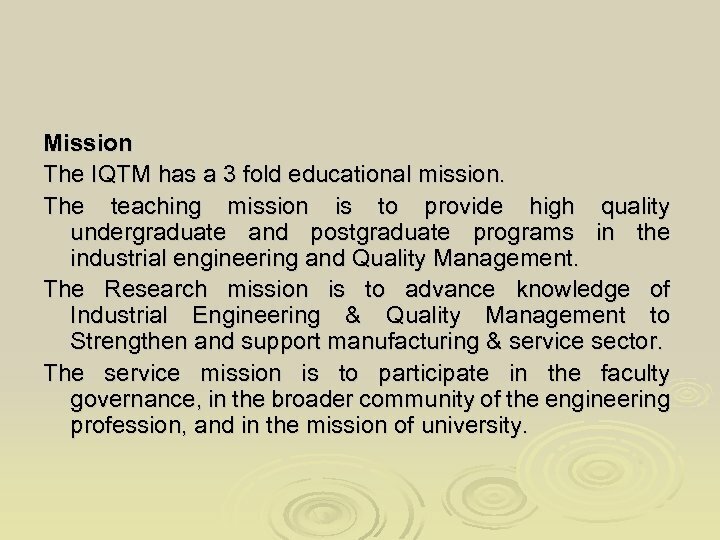 Mission The IQTM has a 3 fold educational mission. 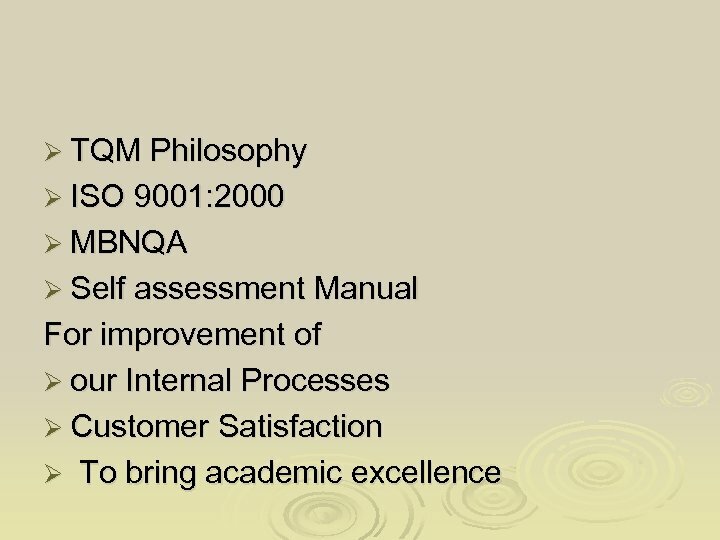 The teaching mission is to provide high quality undergraduate and postgraduate programs in the industrial engineering and Quality Management. The Research mission is to advance knowledge of Industrial Engineering & Quality Management to Strengthen and support manufacturing & service sector. The service mission is to participate in the faculty governance, in the broader community of the engineering profession, and in the mission of university. 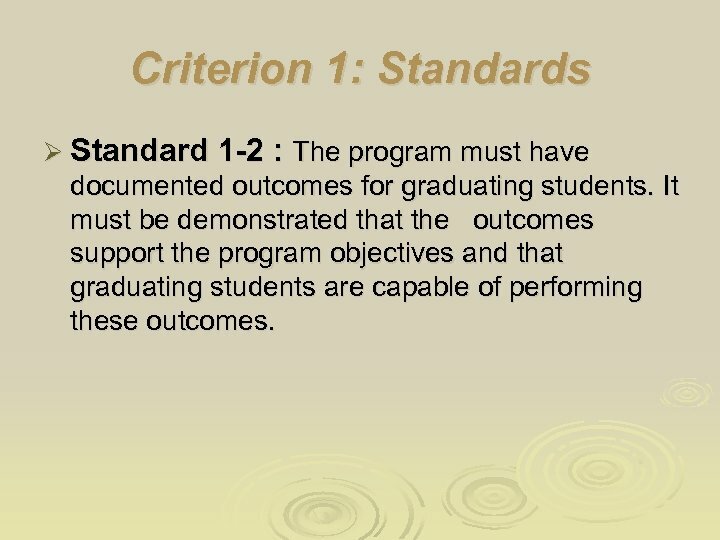 Criterion 1: Standards Ø Standard 1 -2 : The program must have documented outcomes for graduating students. 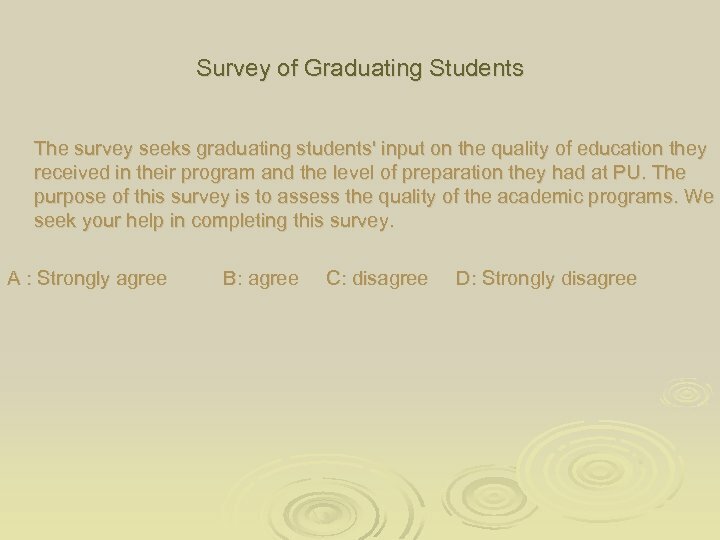 It must be demonstrated that the outcomes support the program objectives and that graduating students are capable of performing these outcomes. 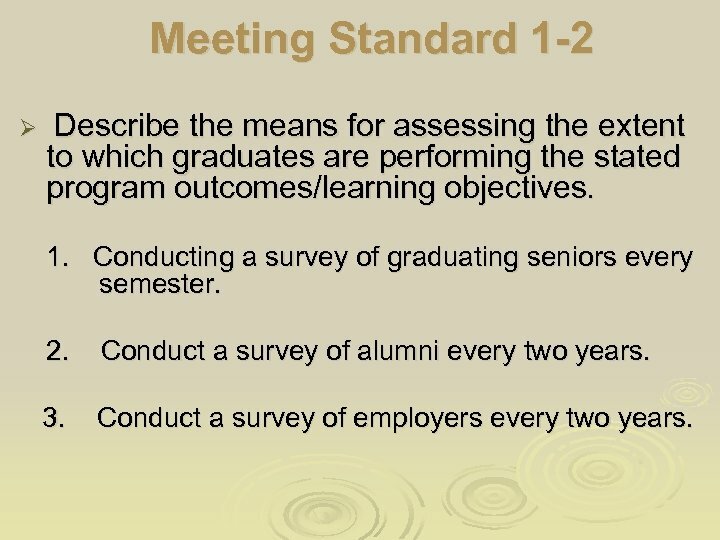 Meeting Standard 1 -2 Ø Describe the means for assessing the extent to which graduates are performing the stated program outcomes/learning objectives. 1. 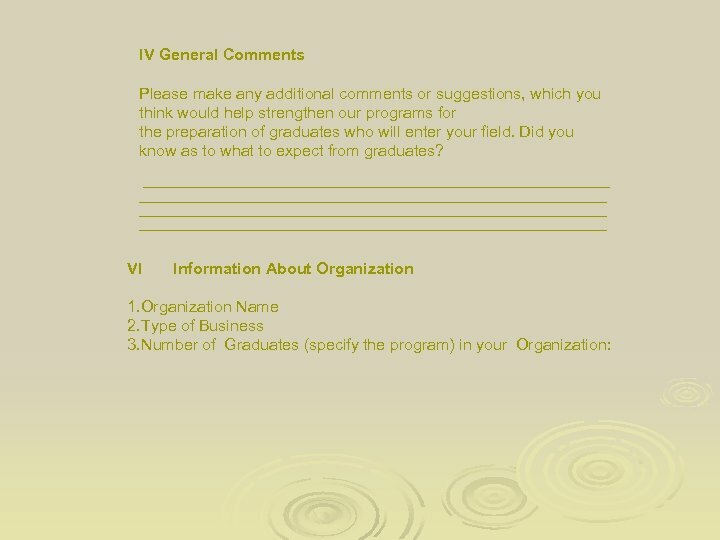 Conducting a survey of graduating seniors every semester. 2. 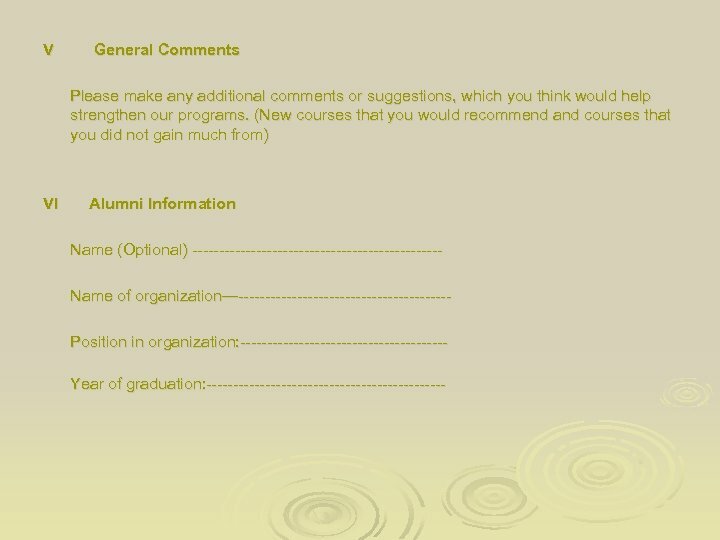 Conduct a survey of alumni every two years. 3. Conduct a survey of employers every two years. 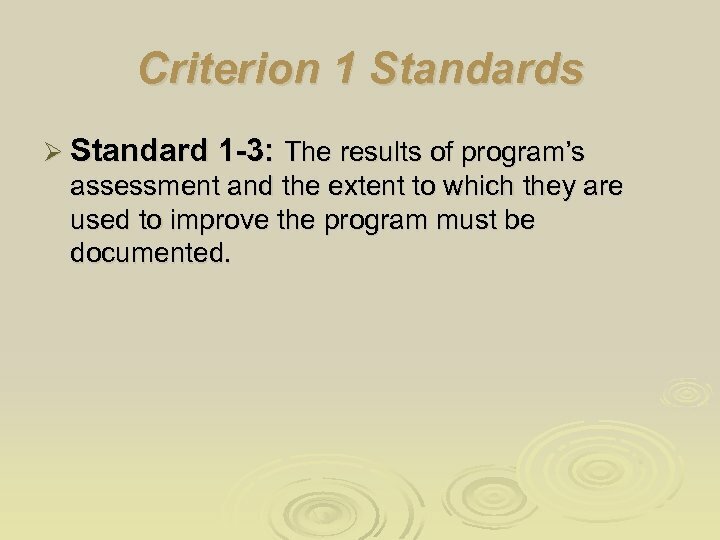 Criterion 1 Standards Ø Standard 1 -3: The results of program’s assessment and the extent to which they are used to improve the program must be documented. 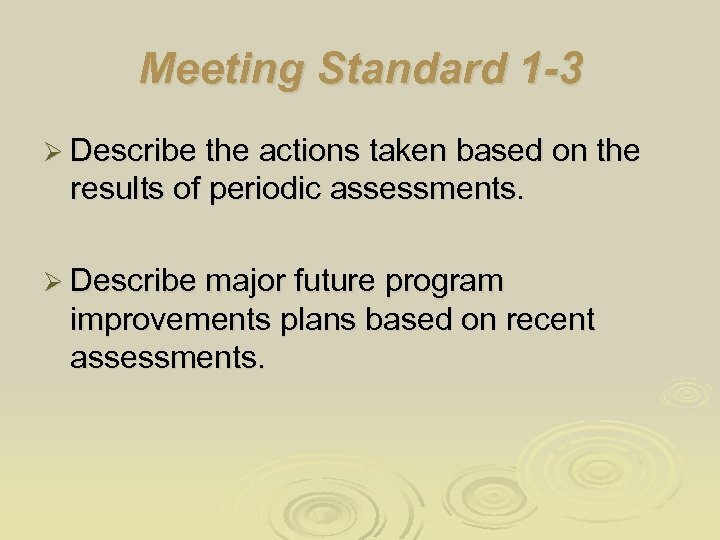 Meeting Standard 1 -3 Ø Describe the actions taken based on the results of periodic assessments. 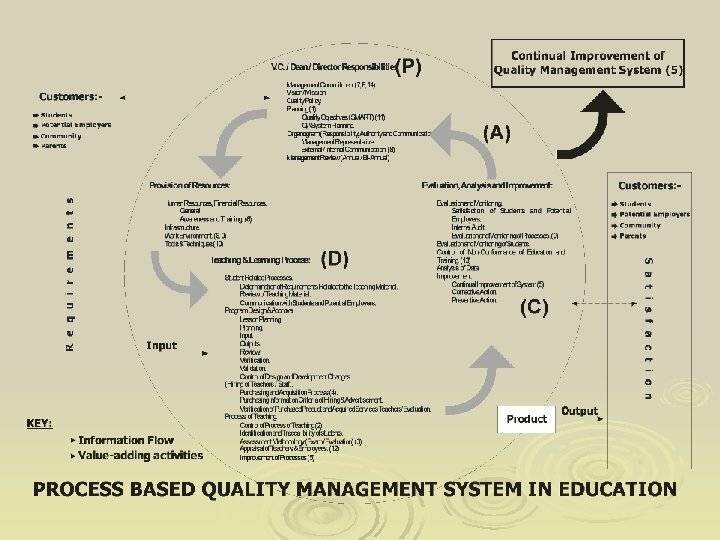 Ø Describe major future program improvements plans based on recent assessments. 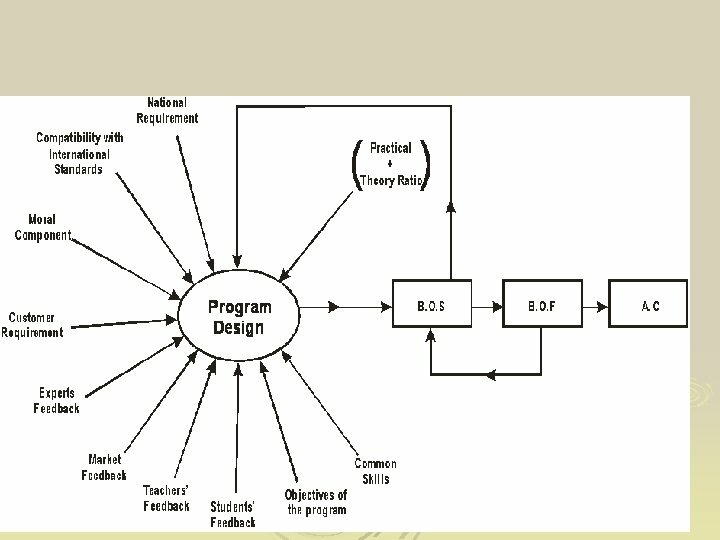 Criterion 2: Curriculum Design and Organization Ø Intent: The curriculum must be designed and organized to achieve the program’s objectives and outcomes. 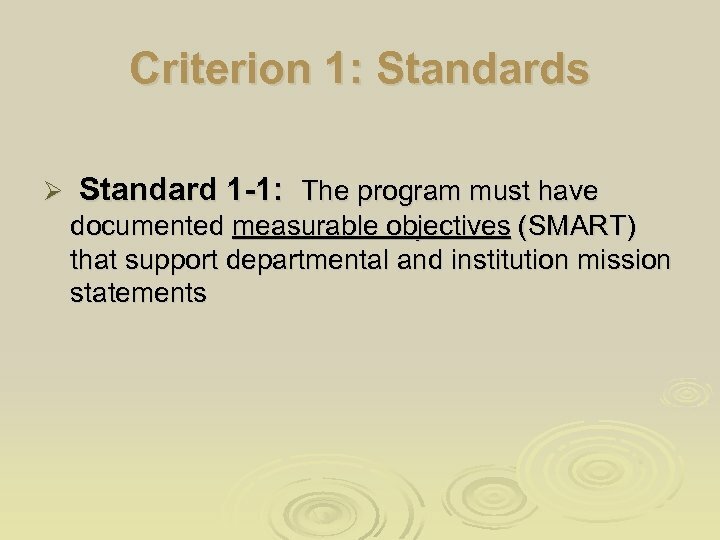 Also course objectives must be in line with program outcomes. 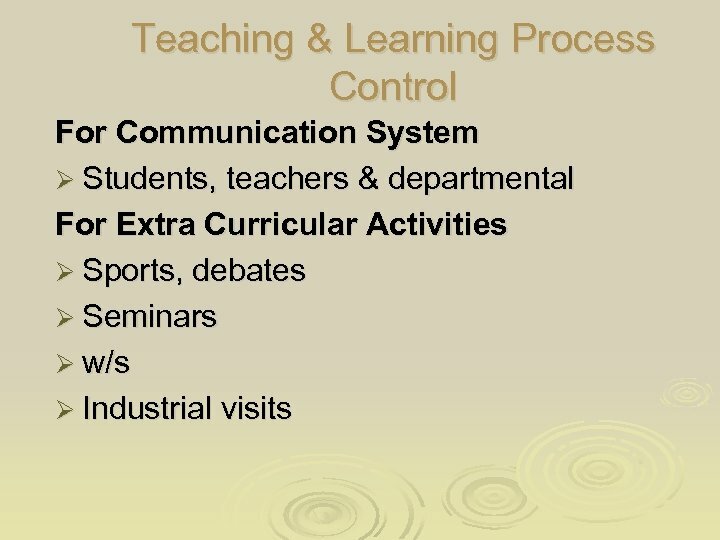 The breakdown of the curriculum must satisfy the standards specified in this section. 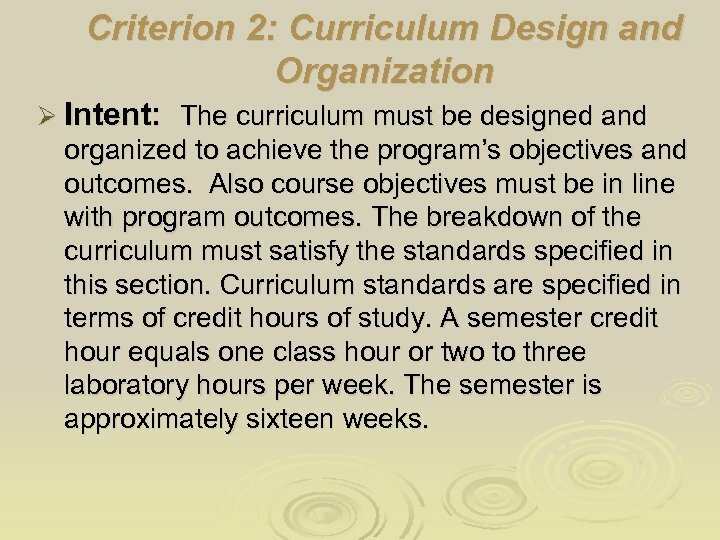 Curriculum standards are specified in terms of credit hours of study. A semester credit hour equals one class hour or two to three laboratory hours per week. The semester is approximately sixteen weeks. 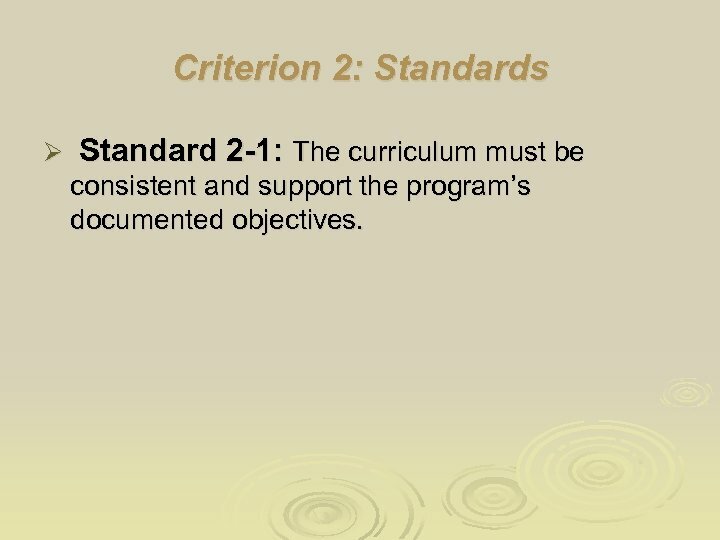 Criterion 2: Standards Ø Standard 2 -1: The curriculum must be consistent and support the program’s documented objectives. 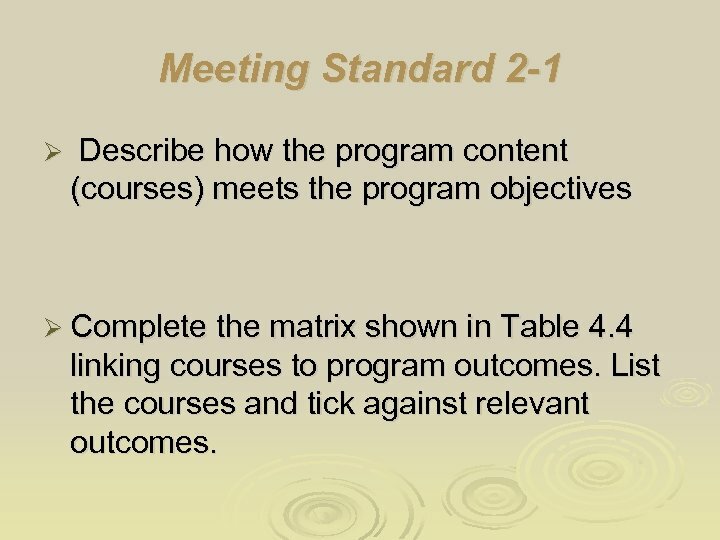 Meeting Standard 2 -1 Ø Describe how the program content (courses) meets the program objectives Ø Complete the matrix shown in Table 4. 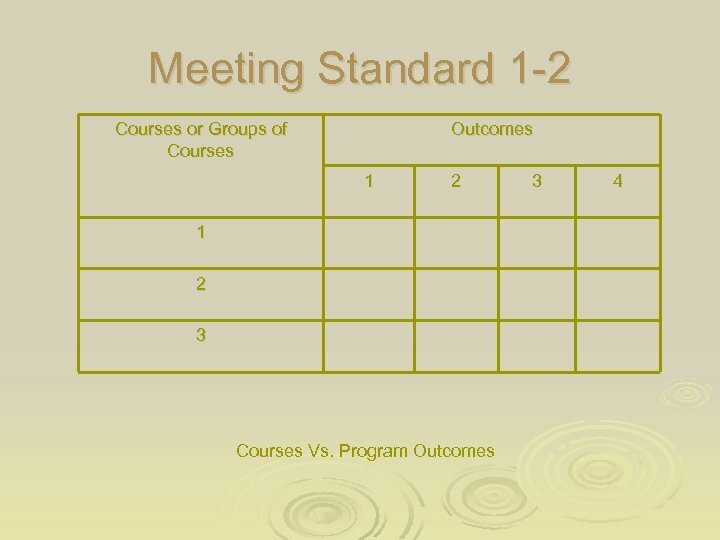 4 linking courses to program outcomes. 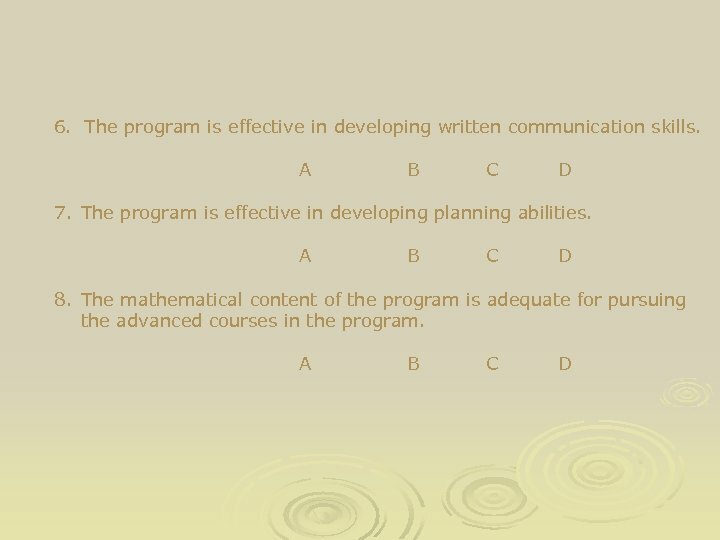 List the courses and tick against relevant outcomes. 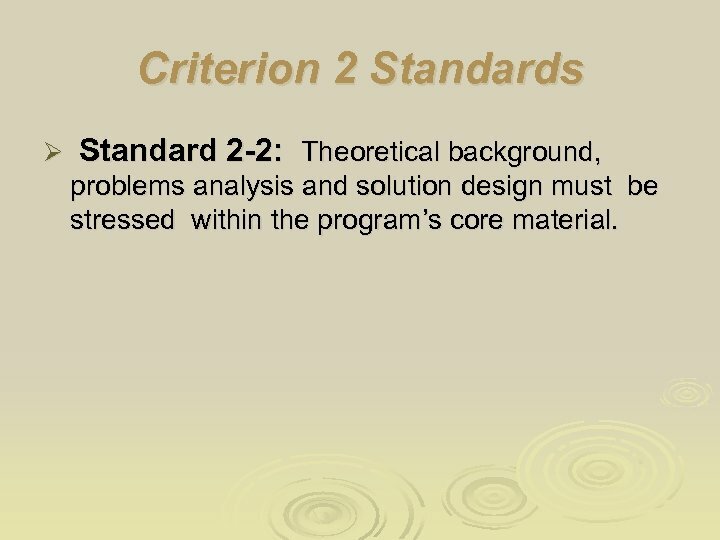 Criterion 2 Standards Ø Standard 2 -2: Theoretical background, problems analysis and solution design must be stressed within the program’s core material. 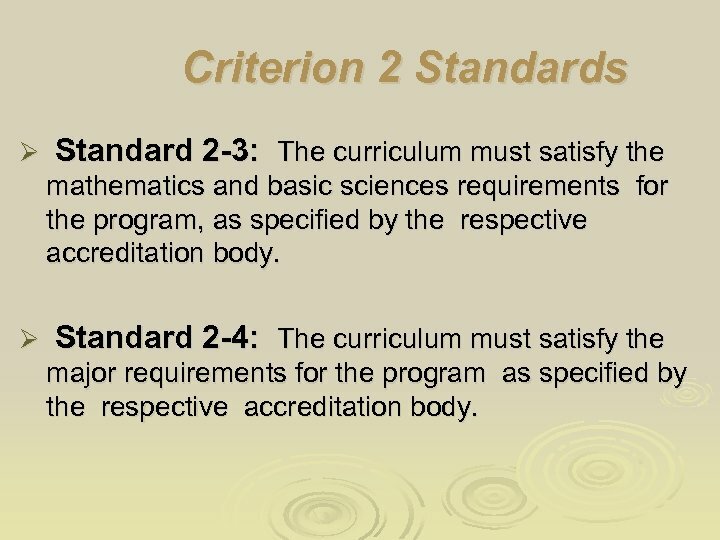 Criterion 2 Standards Ø Standard 2 -3: The curriculum must satisfy the mathematics and basic sciences requirements for the program, as specified by the respective accreditation body. 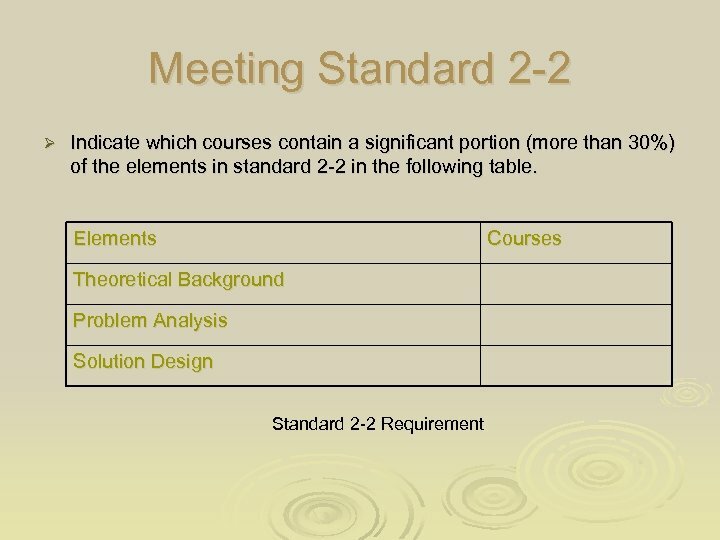 Ø Standard 2 -4: The curriculum must satisfy the major requirements for the program as specified by the respective accreditation body. 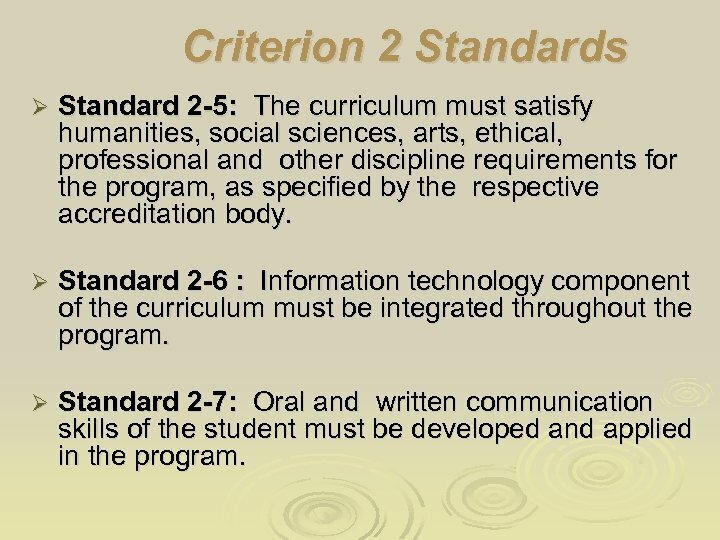 Criterion 2 Standards Ø Standard 2 -5: The curriculum must satisfy humanities, social sciences, arts, ethical, professional and other discipline requirements for the program, as specified by the respective accreditation body. 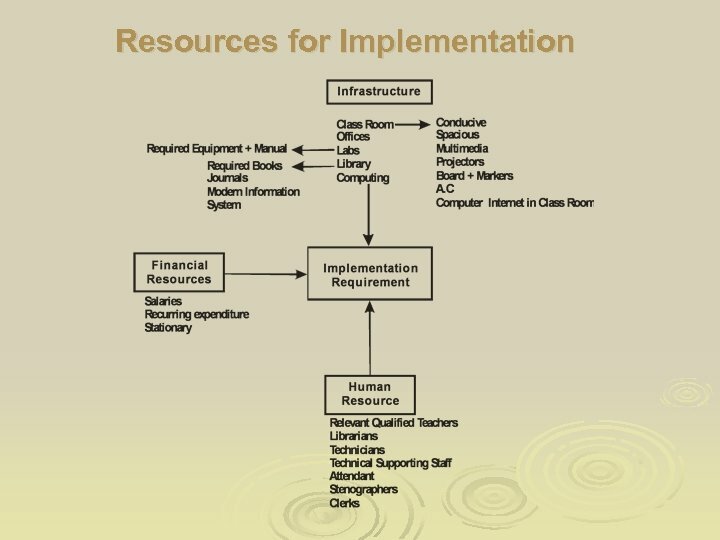 Ø Standard 2 -6 : Information technology component of the curriculum must be integrated throughout the program. 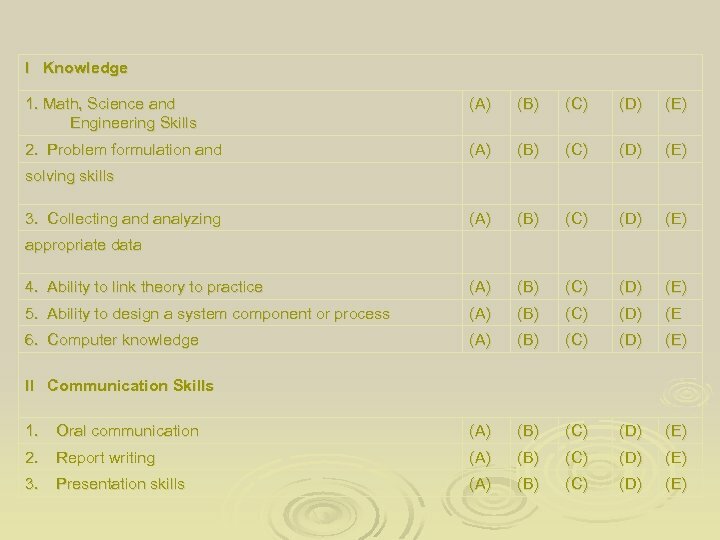 Ø Standard 2 -7: Oral and written communication skills of the student must be developed and applied in the program. 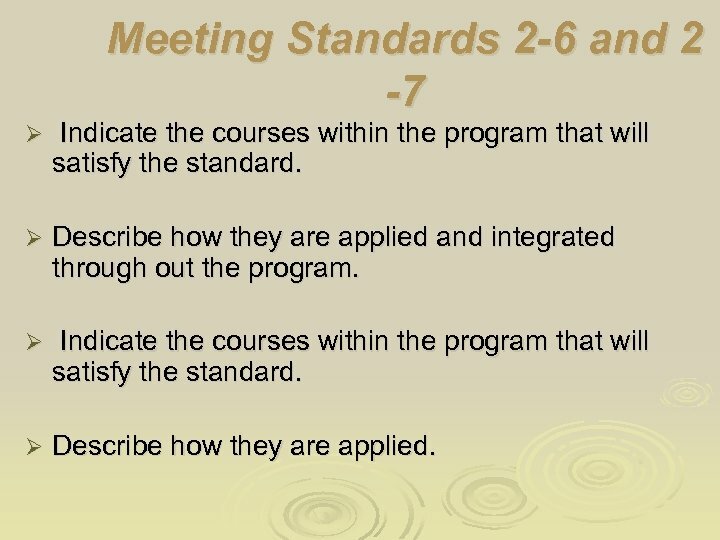 Meeting Standards 2 -6 and 2 -7 Ø Indicate the courses within the program that will satisfy the standard. 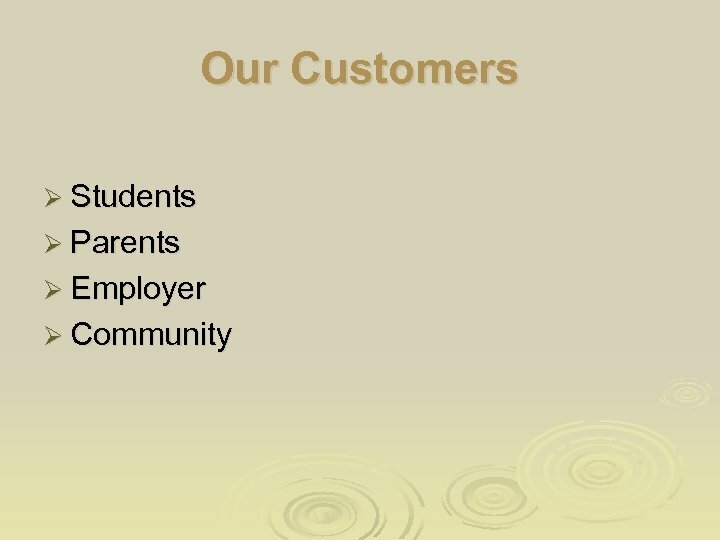 Ø Describe how they are applied and integrated through out the program. 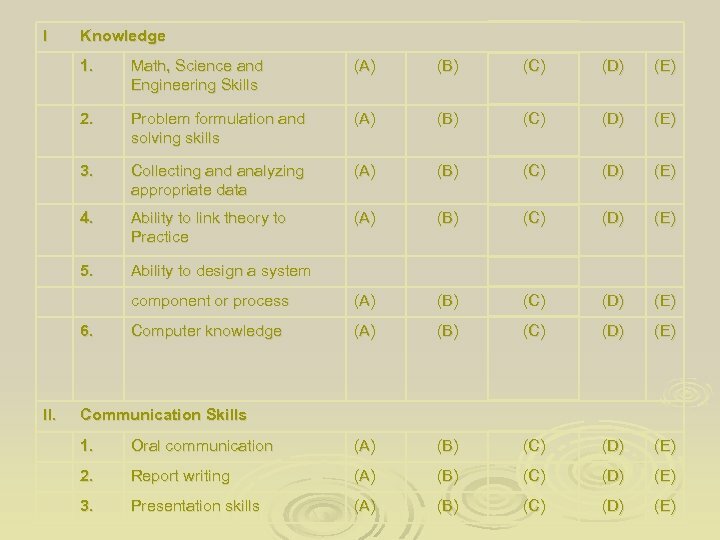 Ø Indicate the courses within the program that will satisfy the standard. 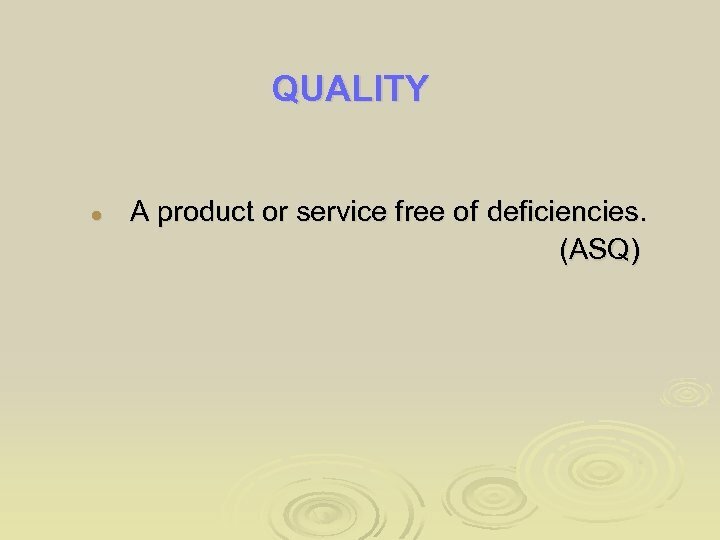 Ø Describe how they are applied. 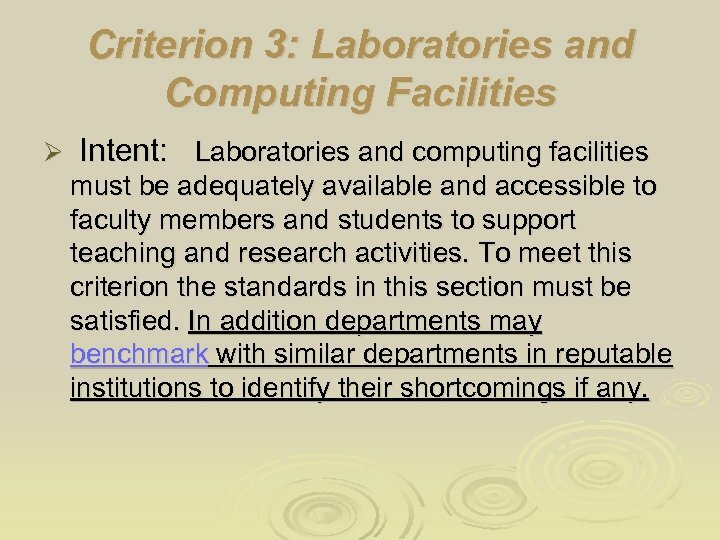 Criterion 3: Laboratories and Computing Facilities Ø Intent: Laboratories and computing facilities must be adequately available and accessible to faculty members and students to support teaching and research activities. To meet this criterion the standards in this section must be satisfied. 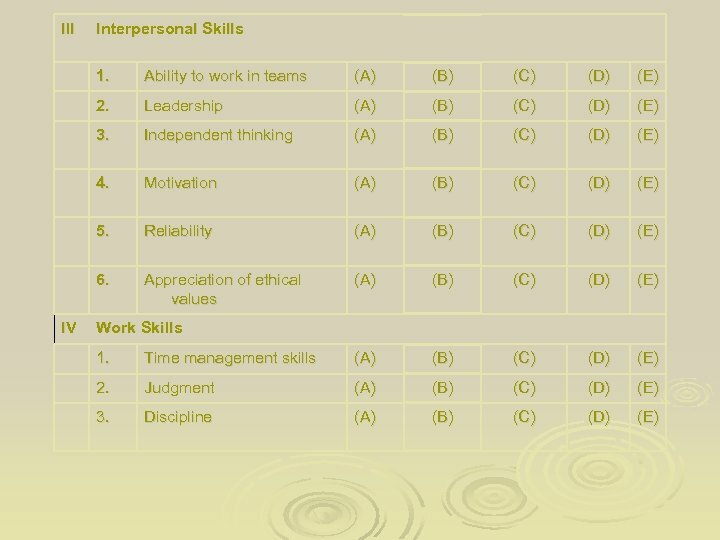 In addition departments may benchmark with similar departments in reputable institutions to identify their shortcomings if any. 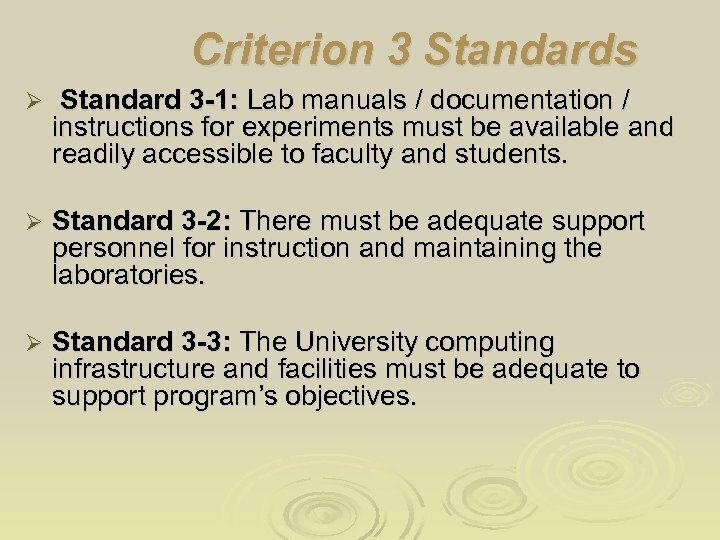 Criterion 3 Standards Ø Standard 3 -1: Lab manuals / documentation / instructions for experiments must be available and readily accessible to faculty and students. 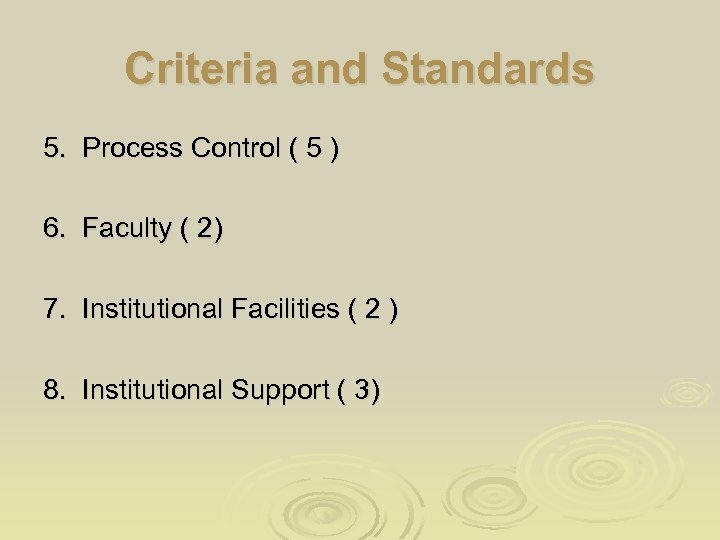 Ø Standard 3 -2: There must be adequate support personnel for instruction and maintaining the laboratories. 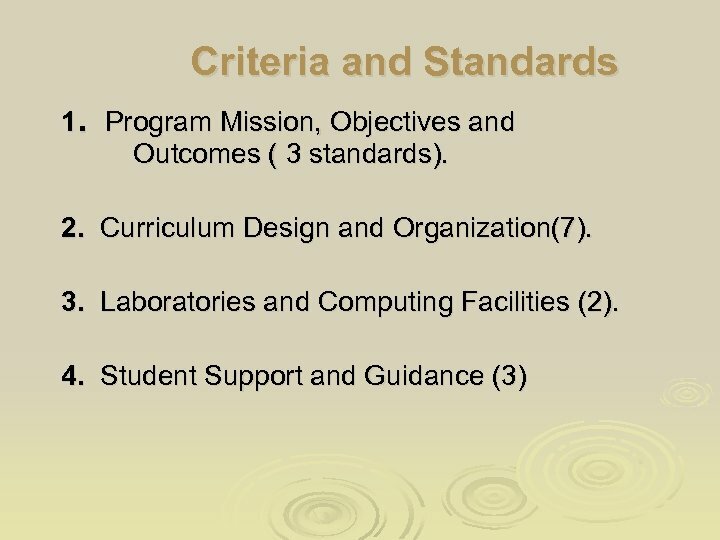 Ø Standard 3 -3: The University computing infrastructure and facilities must be adequate to support program’s objectives. 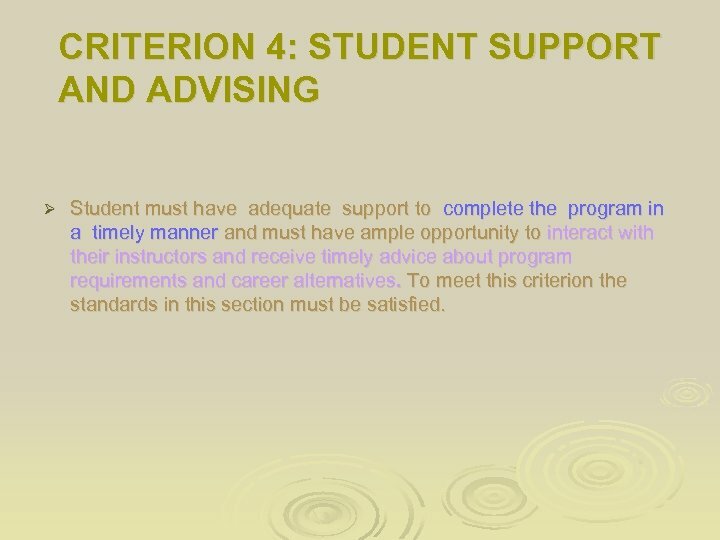 CRITERION 4: STUDENT SUPPORT AND ADVISING Ø Student must have adequate support to complete the program in a timely manner and must have ample opportunity to interact with their instructors and receive timely advice about program requirements and career alternatives. 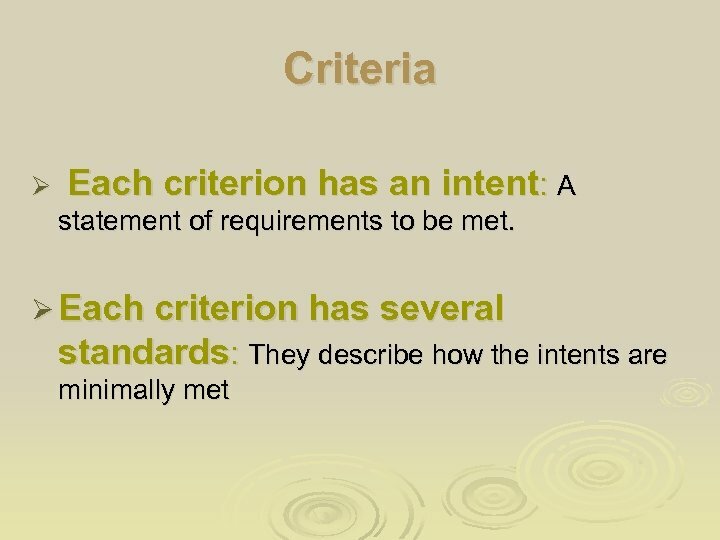 To meet this criterion the standards in this section must be satisfied. 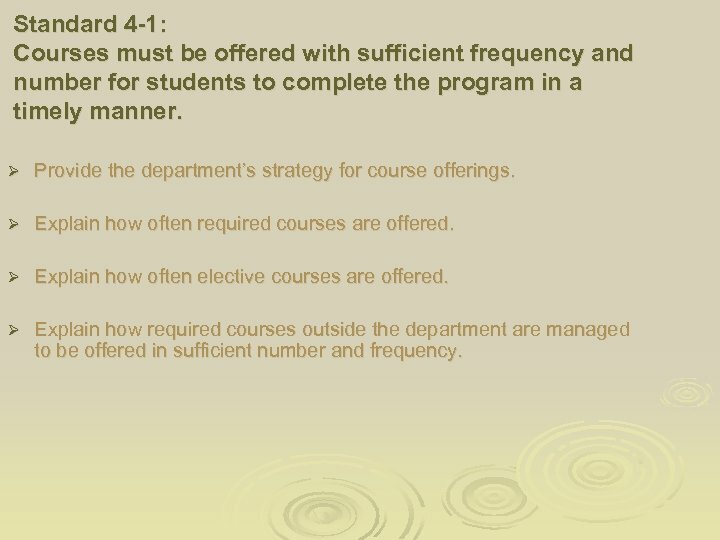 Standard 4 -1: Courses must be offered with sufficient frequency and number for students to complete the program in a timely manner. 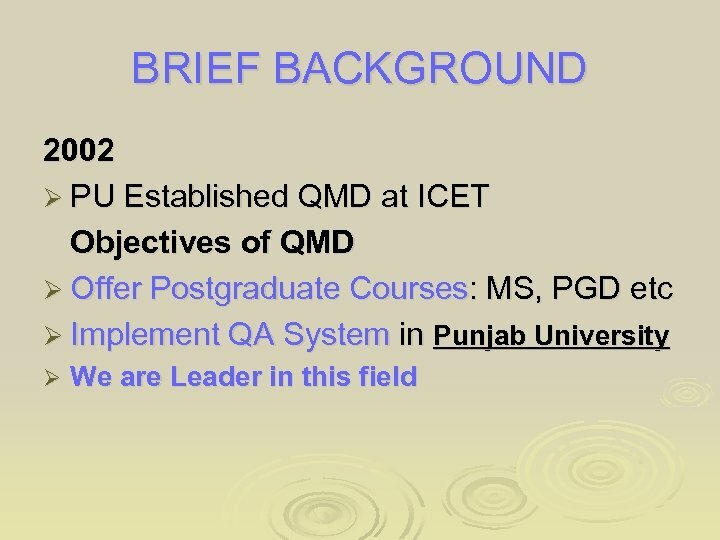 Ø Provide the department’s strategy for course offerings. Ø Explain how often required courses are offered. 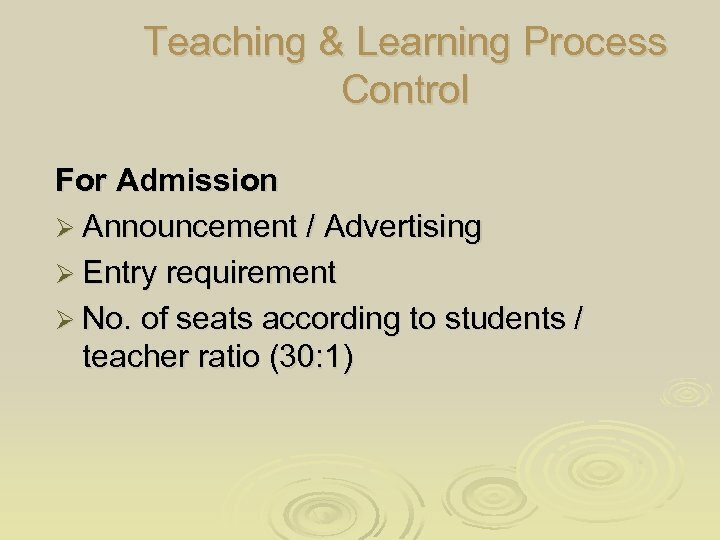 Ø Explain how often elective courses are offered. 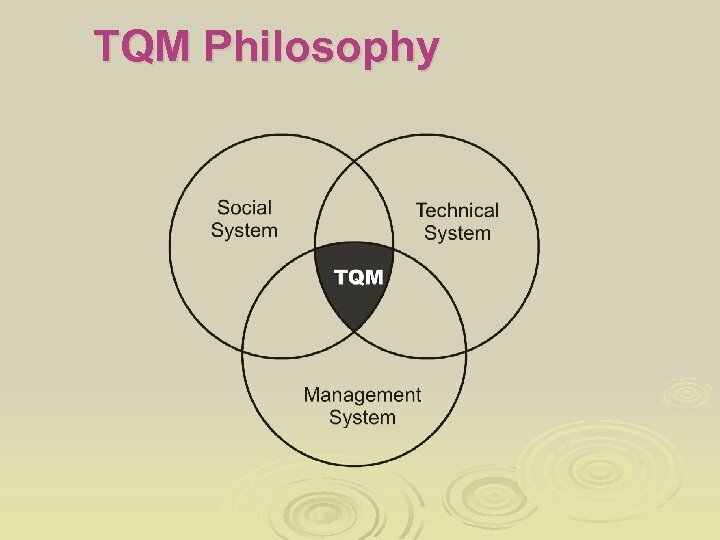 Ø Explain how required courses outside the department are managed to be offered in sufficient number and frequency. 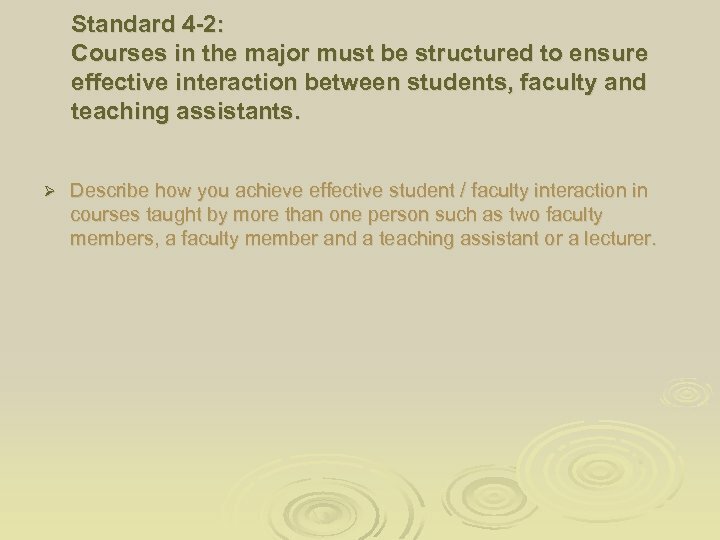 Standard 4 -2: Courses in the major must be structured to ensure effective interaction between students, faculty and teaching assistants. 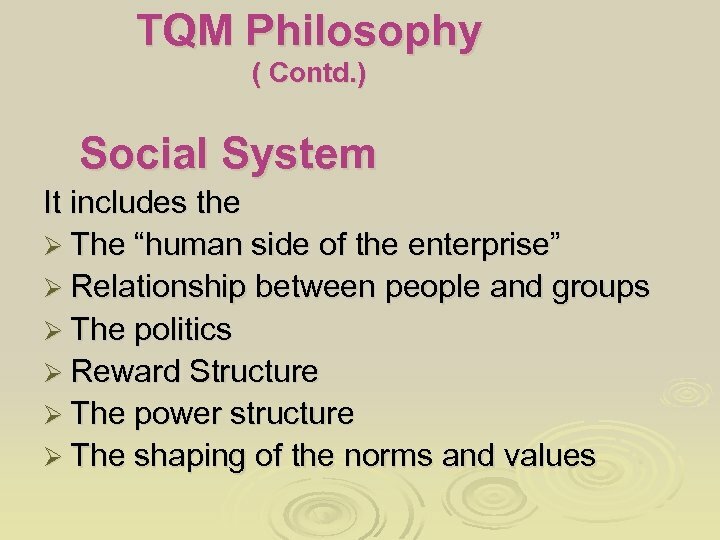 Ø Describe how you achieve effective student / faculty interaction in courses taught by more than one person such as two faculty members, a faculty member and a teaching assistant or a lecturer. 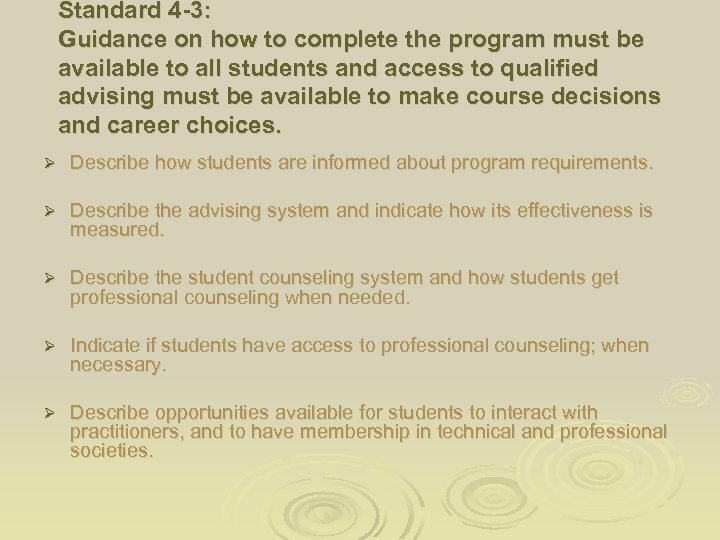 Standard 4 -3: Guidance on how to complete the program must be available to all students and access to qualified advising must be available to make course decisions and career choices. 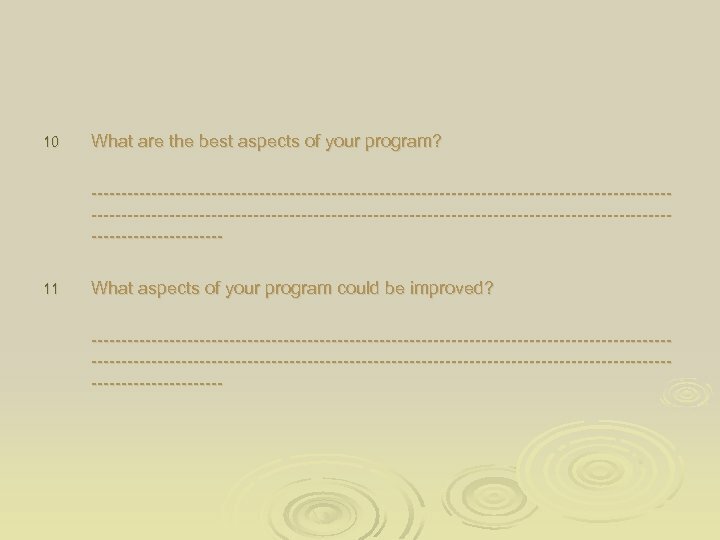 Ø Describe how students are informed about program requirements. Ø Describe the advising system and indicate how its effectiveness is measured. 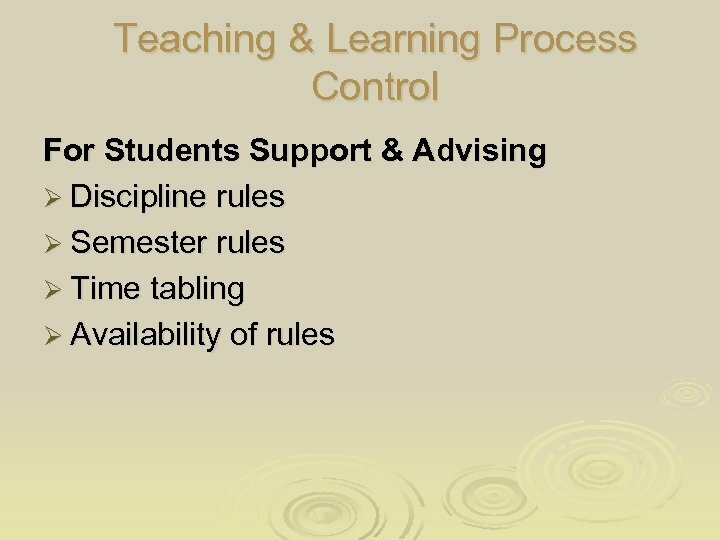 Ø Describe the student counseling system and how students get professional counseling when needed. Ø Indicate if students have access to professional counseling; when necessary. 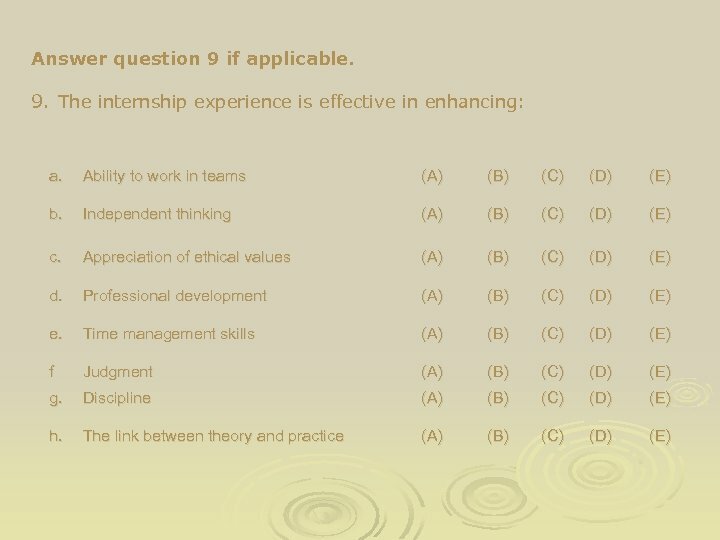 Ø Describe opportunities available for students to interact with practitioners, and to have membership in technical and professional societies. 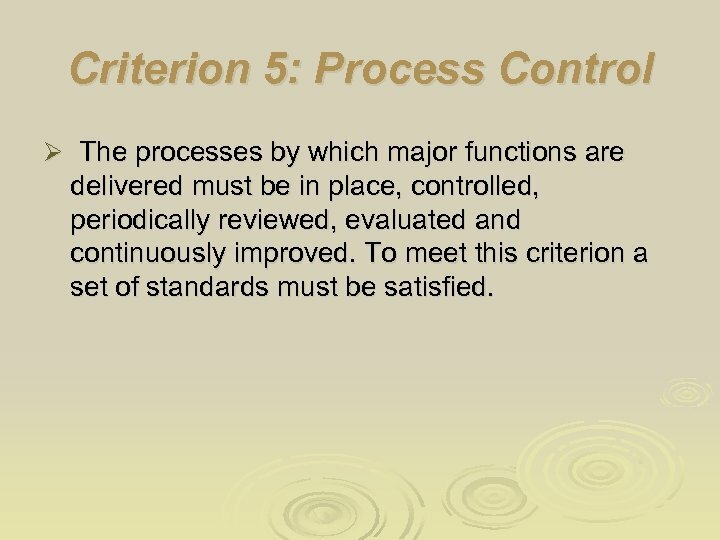 Criterion 5: Process Control Ø The processes by which major functions are delivered must be in place, controlled, periodically reviewed, evaluated and continuously improved. 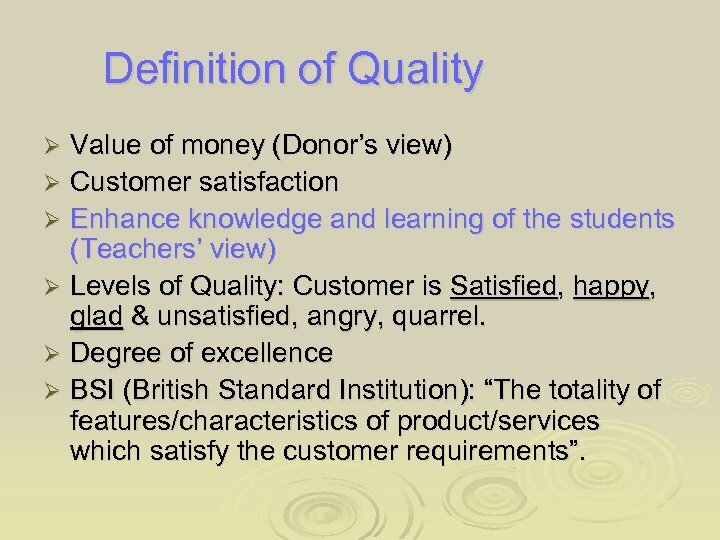 To meet this criterion a set of standards must be satisfied. 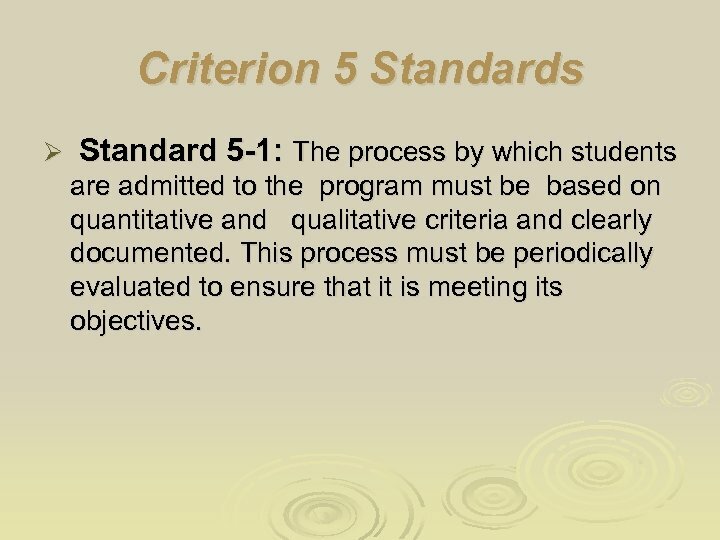 Criterion 5 Standards Ø Standard 5 -1: The process by which students are admitted to the program must be based on quantitative and qualitative criteria and clearly documented. This process must be periodically evaluated to ensure that it is meeting its objectives. 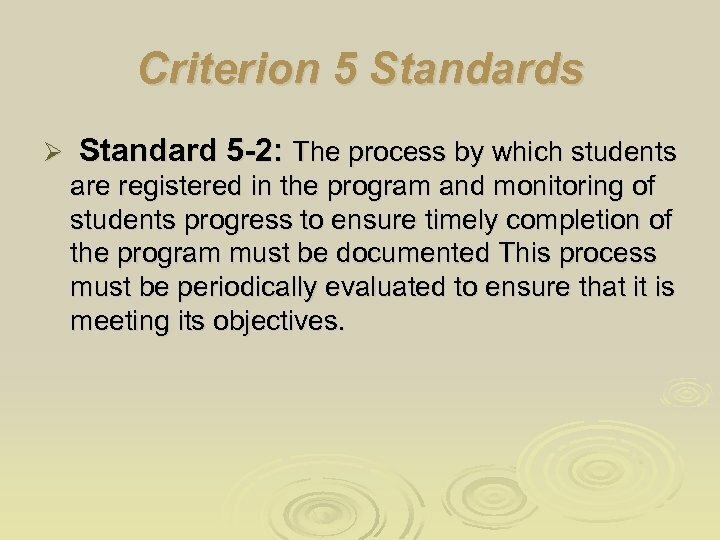 Criterion 5 Standards Ø Standard 5 -2: The process by which students are registered in the program and monitoring of students progress to ensure timely completion of the program must be documented This process must be periodically evaluated to ensure that it is meeting its objectives. 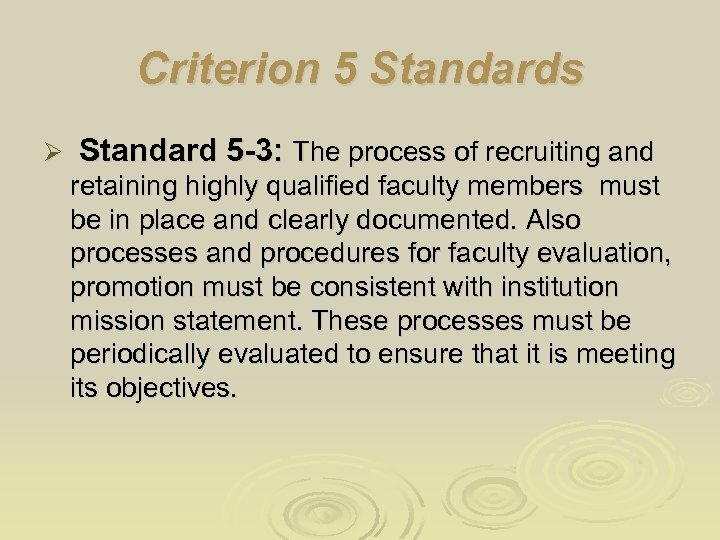 Criterion 5 Standards Ø Standard 5 -3: The process of recruiting and retaining highly qualified faculty members must be in place and clearly documented. 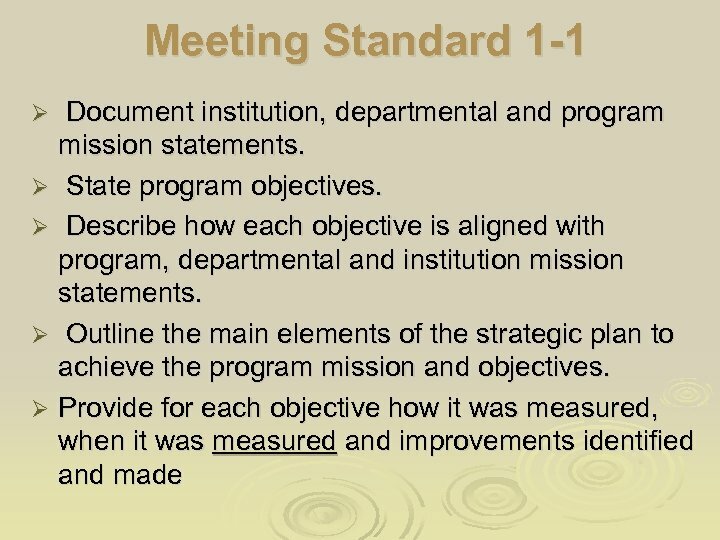 Also processes and procedures for faculty evaluation, promotion must be consistent with institution mission statement. 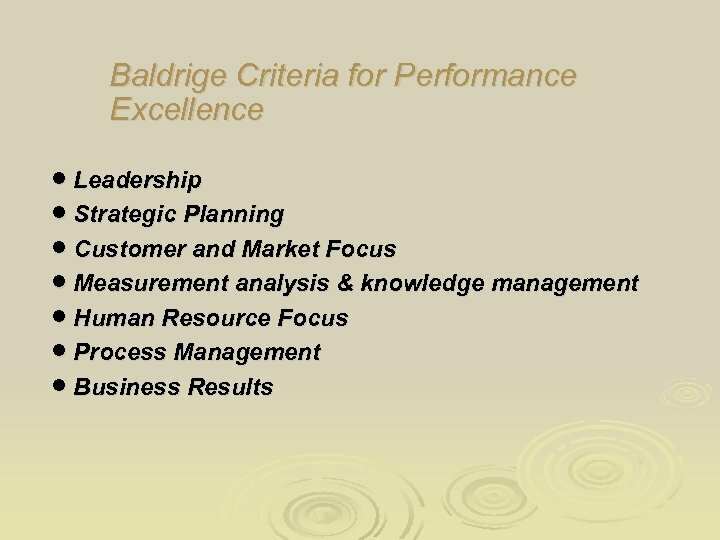 These processes must be periodically evaluated to ensure that it is meeting its objectives. 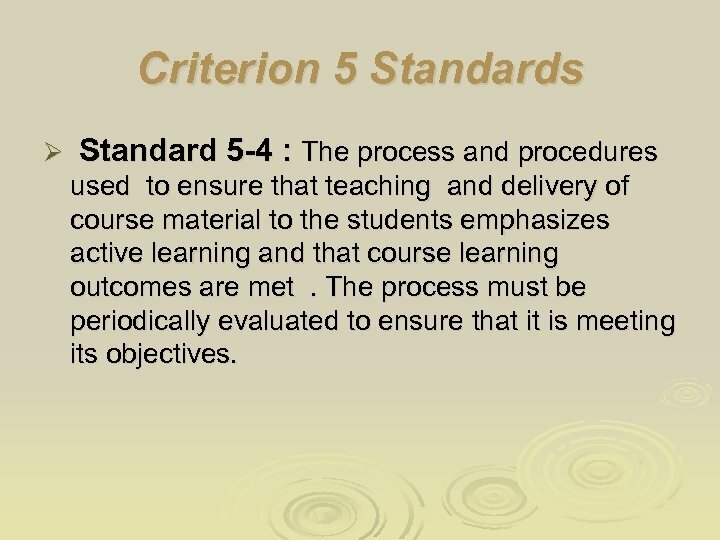 Criterion 5 Standards Ø Standard 5 -4 : The process and procedures used to ensure that teaching and delivery of course material to the students emphasizes active learning and that course learning outcomes are met . The process must be periodically evaluated to ensure that it is meeting its objectives. 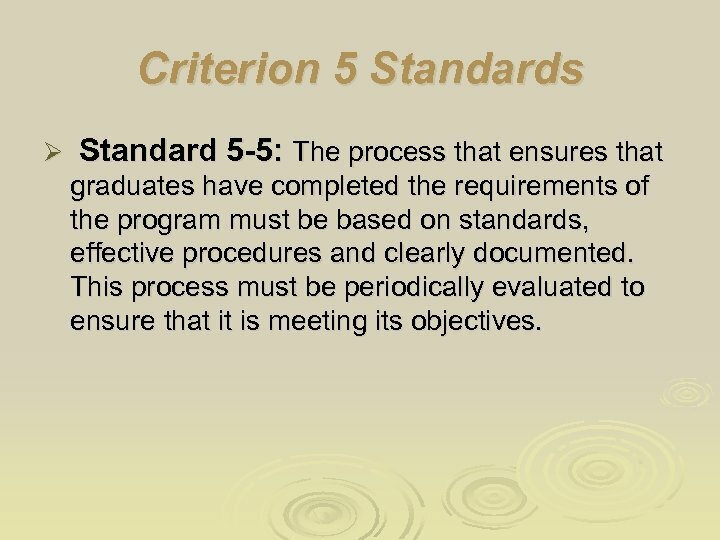 Criterion 5 Standards Ø Standard 5 -5: The process that ensures that graduates have completed the requirements of the program must be based on standards, effective procedures and clearly documented. This process must be periodically evaluated to ensure that it is meeting its objectives. 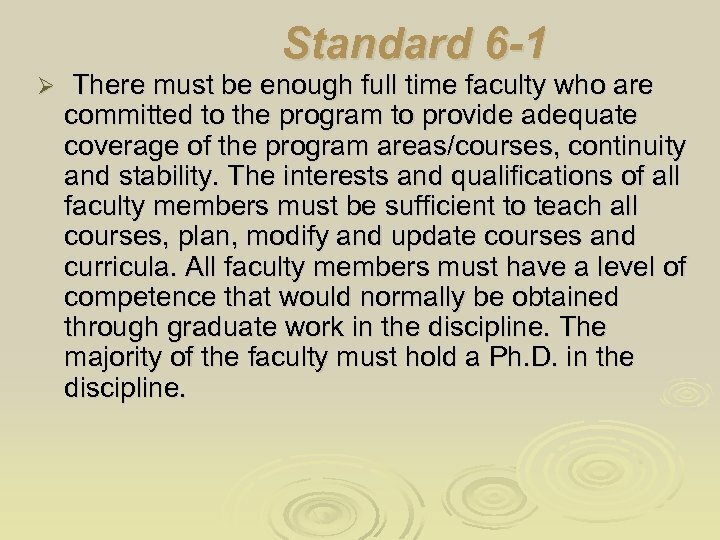 Standard 6 -1 Ø There must be enough full time faculty who are committed to the program to provide adequate coverage of the program areas/courses, continuity and stability. 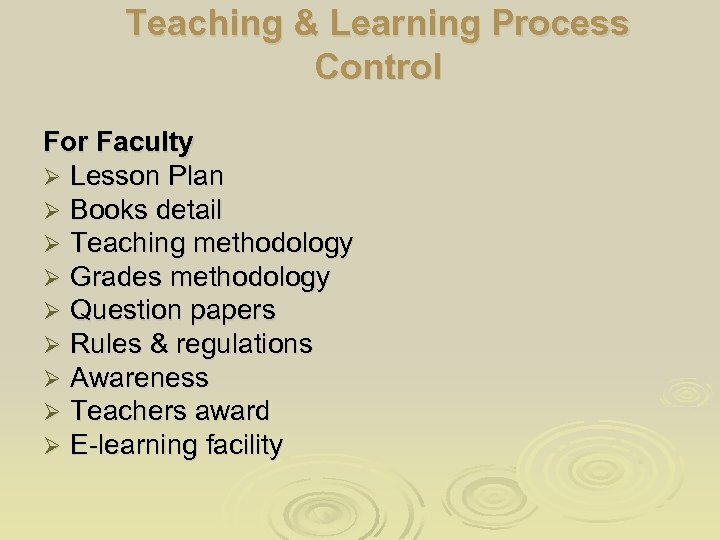 The interests and qualifications of all faculty members must be sufficient to teach all courses, plan, modify and update courses and curricula. All faculty members must have a level of competence that would normally be obtained through graduate work in the discipline. The majority of the faculty must hold a Ph. D. in the discipline. 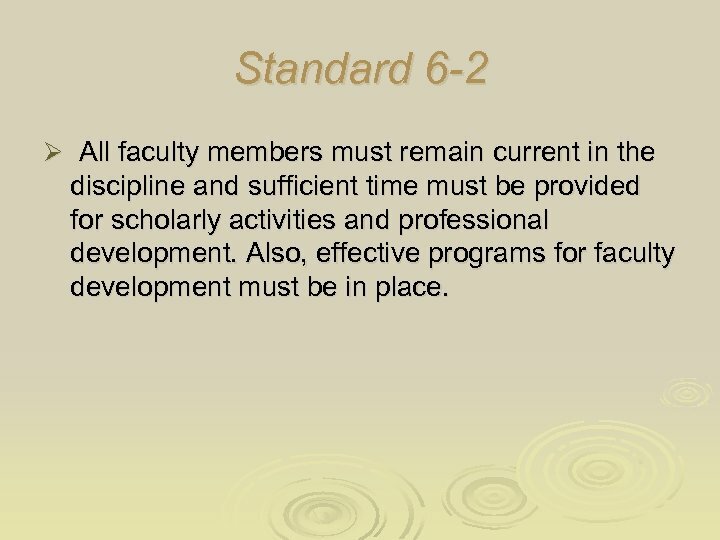 Standard 6 -2 Ø All faculty members must remain current in the discipline and sufficient time must be provided for scholarly activities and professional development. Also, effective programs for faculty development must be in place. 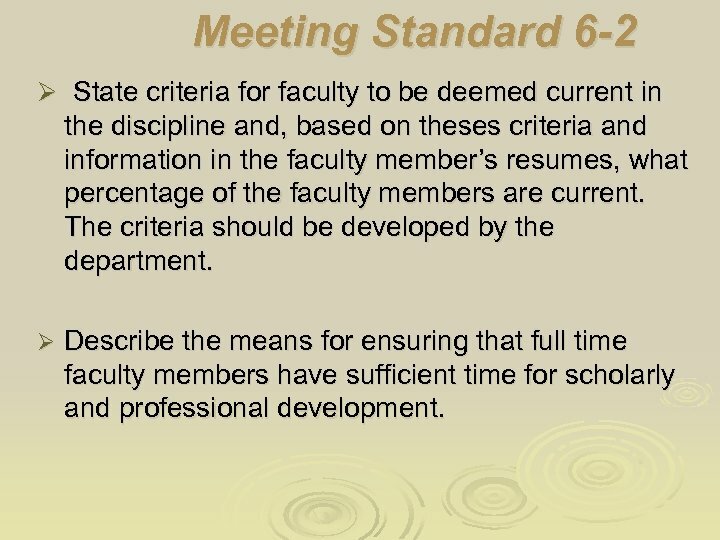 Meeting Standard 6 -2 Ø State criteria for faculty to be deemed current in the discipline and, based on theses criteria and information in the faculty member’s resumes, what percentage of the faculty members are current. The criteria should be developed by the department. 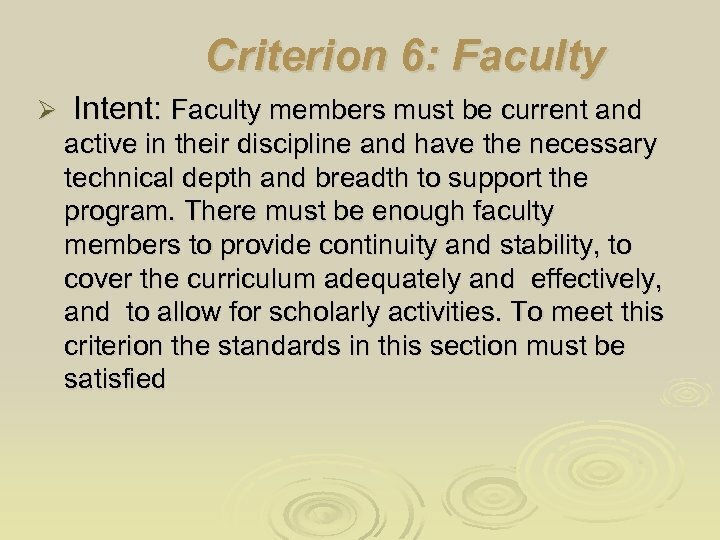 Ø Describe the means for ensuring that full time faculty members have sufficient time for scholarly and professional development. 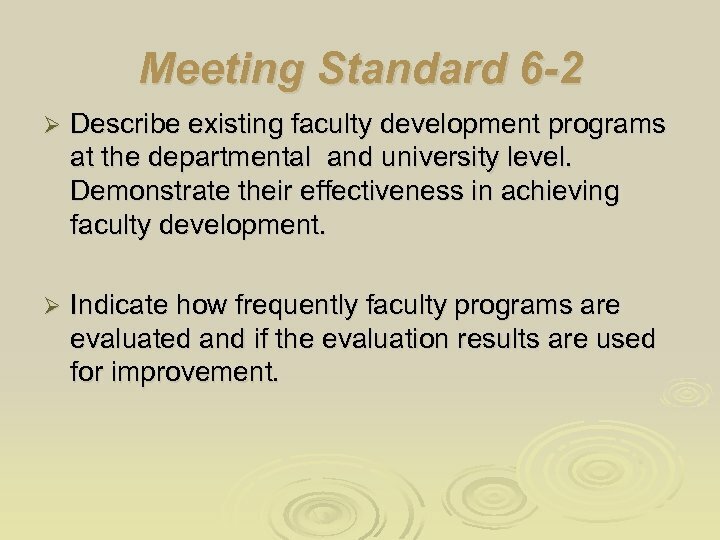 Meeting Standard 6 -2 Ø Describe existing faculty development programs at the departmental and university level. 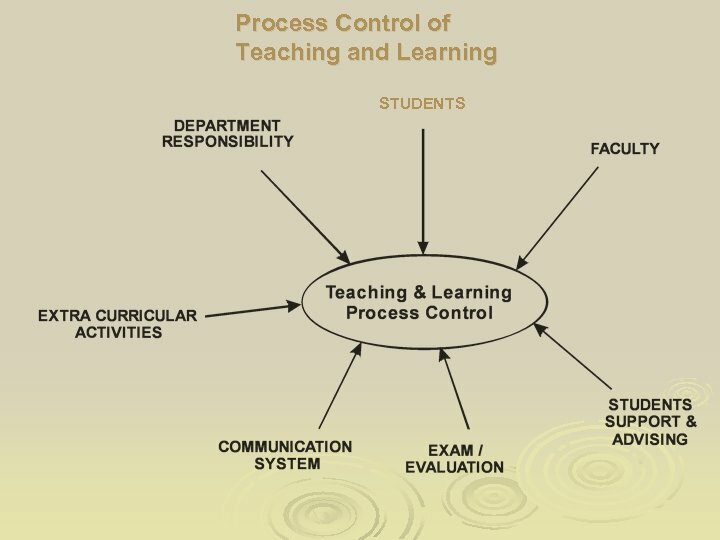 Demonstrate their effectiveness in achieving faculty development. 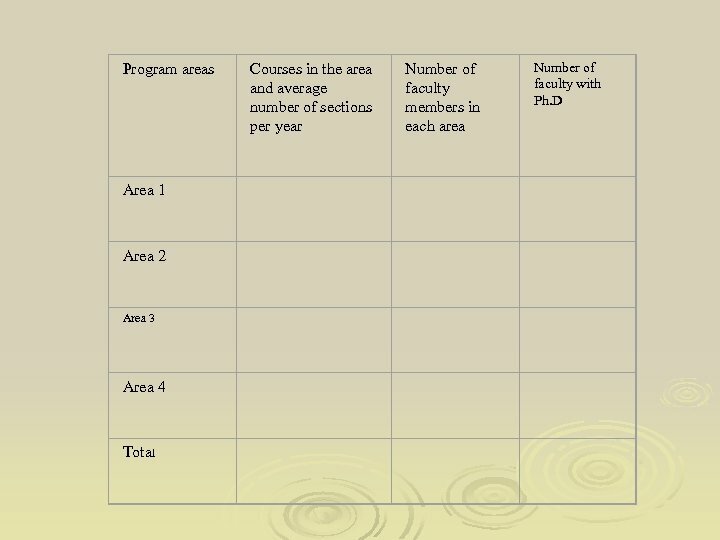 Ø Indicate how frequently faculty programs are evaluated and if the evaluation results are used for improvement. 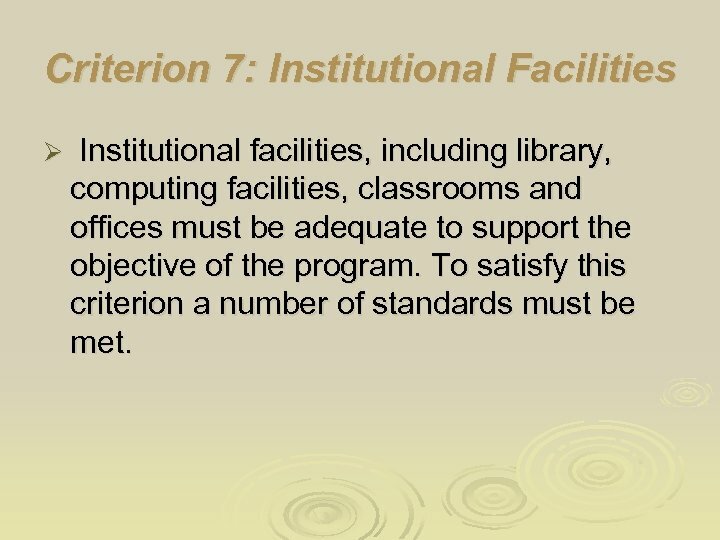 Criterion 7: Institutional Facilities Ø Institutional facilities, including library, computing facilities, classrooms and offices must be adequate to support the objective of the program. To satisfy this criterion a number of standards must be met. 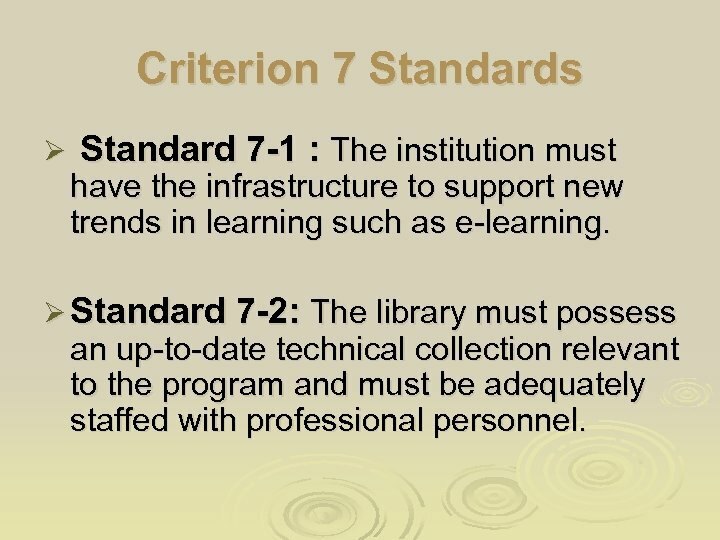 Criterion 7 Standards Ø Standard 7 -1 : The institution must have the infrastructure to support new trends in learning such as e-learning. Ø Standard 7 -2: The library must possess an up-to-date technical collection relevant to the program and must be adequately staffed with professional personnel. 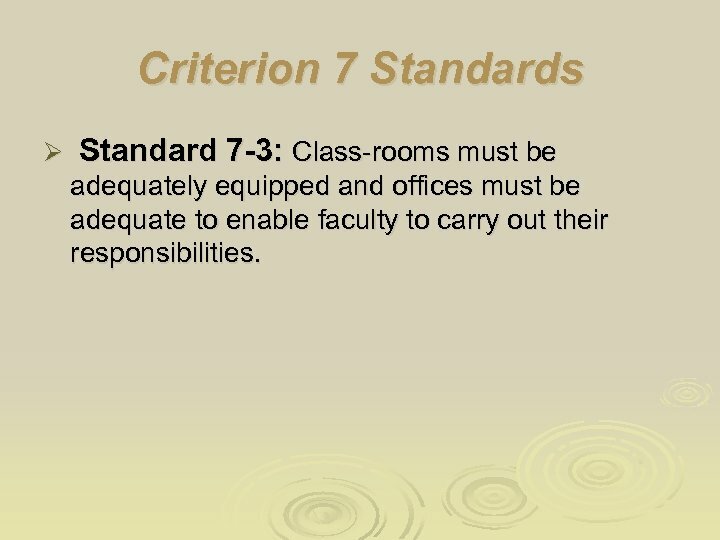 Criterion 7 Standards Ø Standard 7 -3: Class-rooms must be adequately equipped and offices must be adequate to enable faculty to carry out their responsibilities. 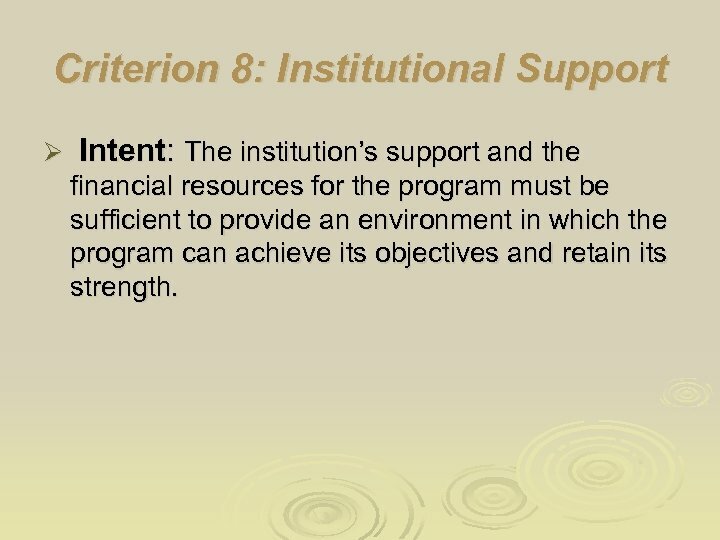 Criterion 8: Institutional Support Ø Intent: The institution’s support and the financial resources for the program must be sufficient to provide an environment in which the program can achieve its objectives and retain its strength. 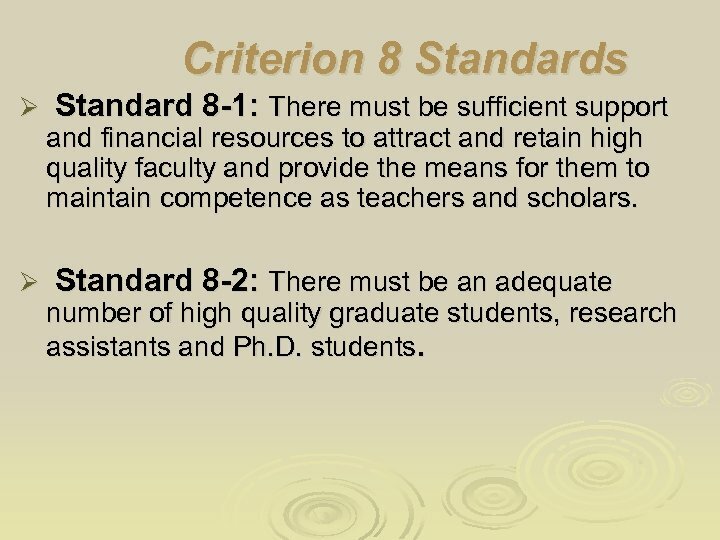 Criterion 8 Standards Ø Standard 8 -1: There must be sufficient support and financial resources to attract and retain high quality faculty and provide the means for them to maintain competence as teachers and scholars. 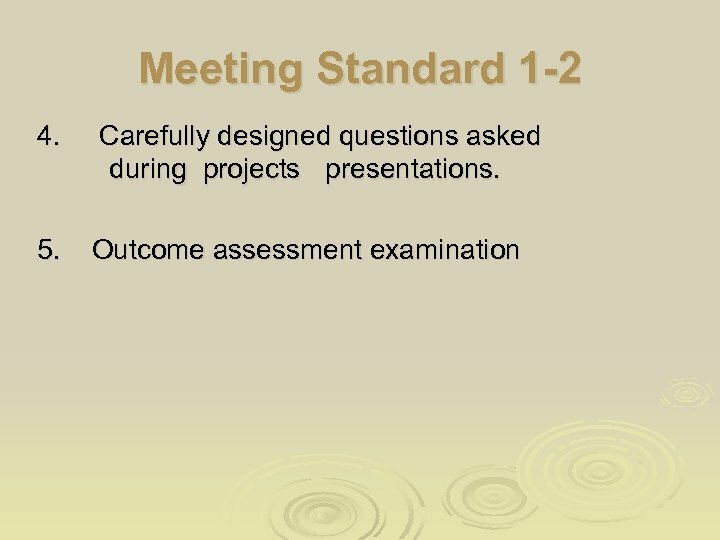 Ø Standard 8 -2: There must be an adequate number of high quality graduate students, research assistants and Ph. D. students. 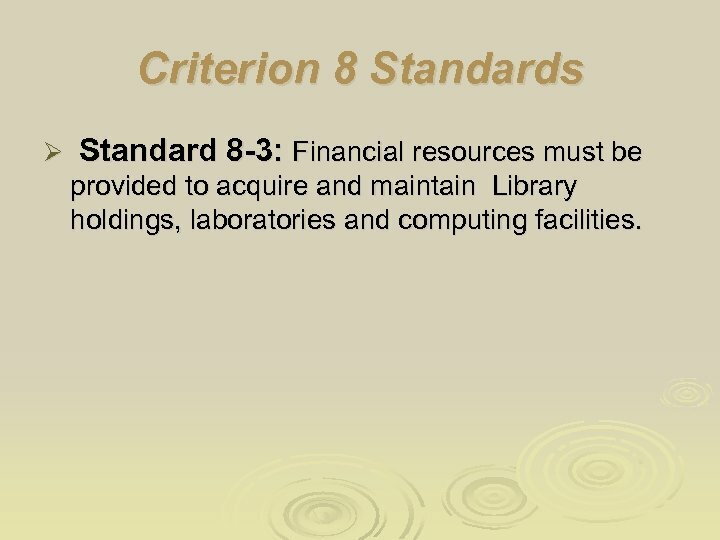 Criterion 8 Standards Ø Standard 8 -3: Financial resources must be provided to acquire and maintain Library holdings, laboratories and computing facilities. Ø 2. 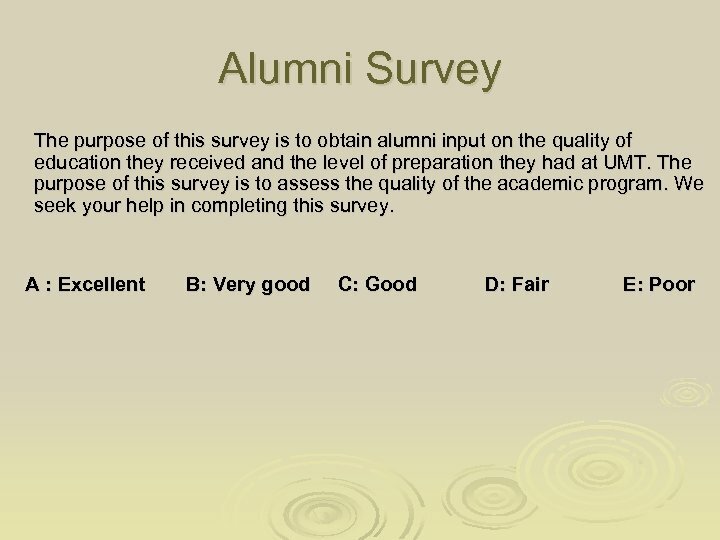 Conduct a survey of alumni every two years. Ø 3. 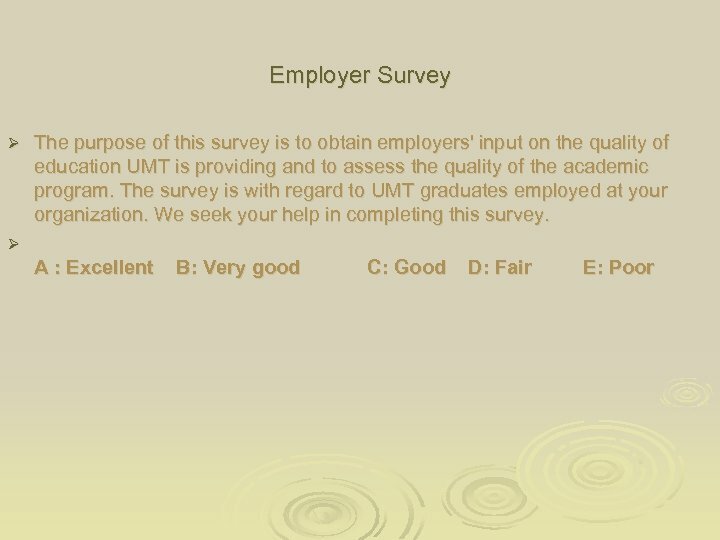 Conduct a survey of employers every two years. 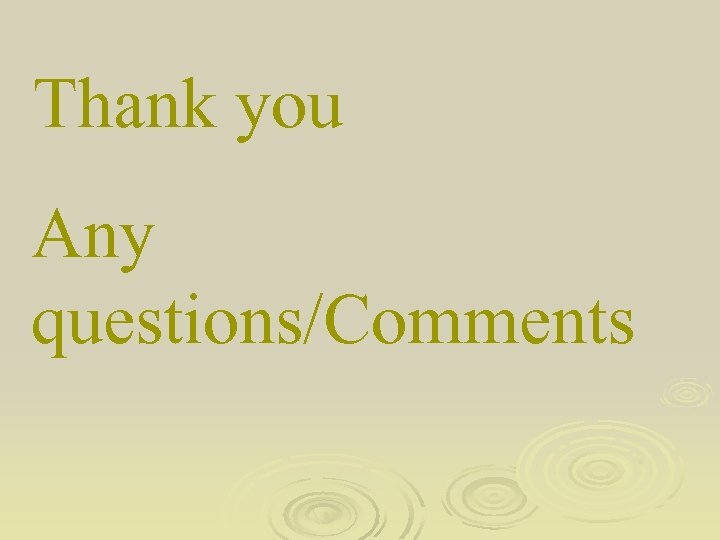 Concluding Remarks Ø Establishing measurable objectives and evaluating their outcomes are sophisticated activities that are essential to assess if programs’ meet their educational objectives. 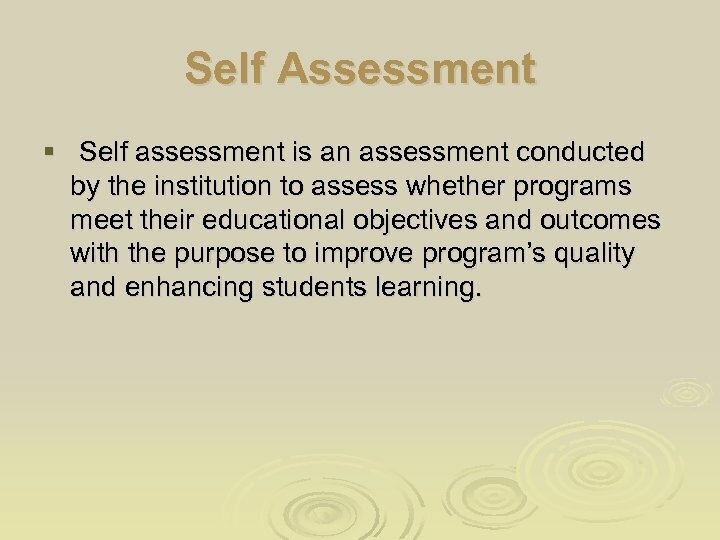 Ø Conducting self assessment is expected to enhance learning. 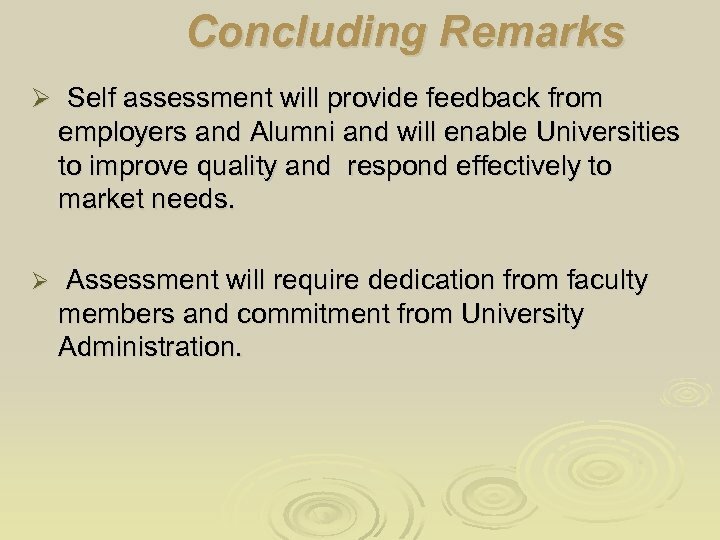 Concluding Remarks Ø Self assessment will provide feedback from employers and Alumni and will enable Universities to improve quality and respond effectively to market needs. 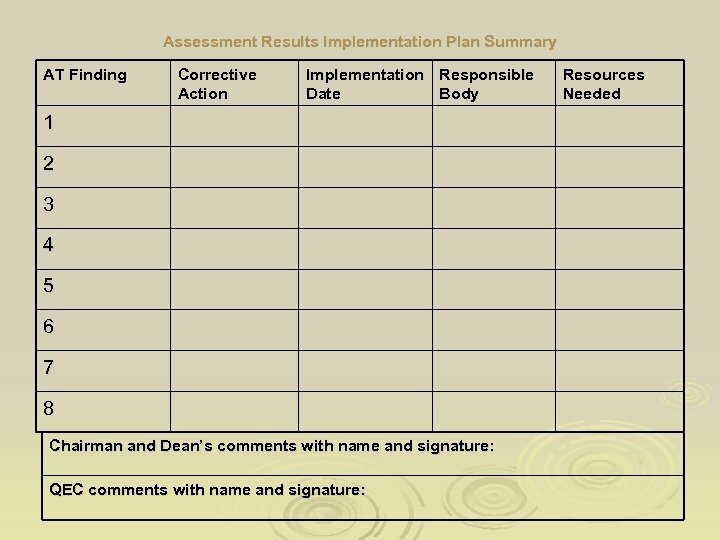 Ø Assessment will require dedication from faculty members and commitment from University Administration. 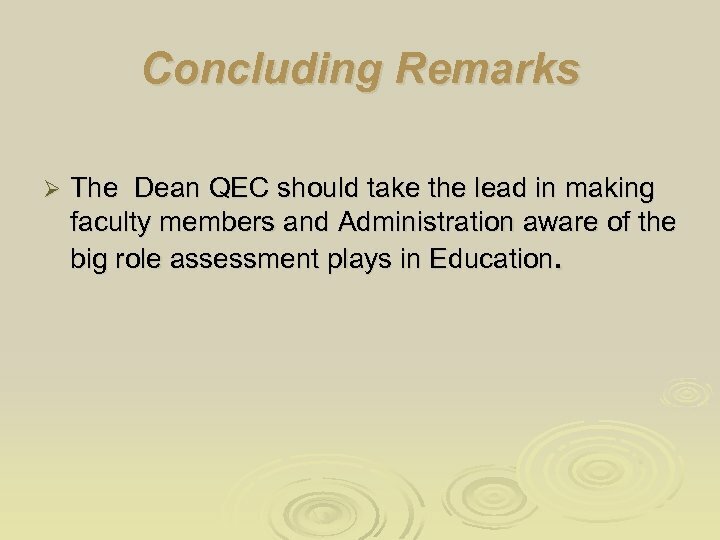 Concluding Remarks Ø The Dean QEC should take the lead in making faculty members and Administration aware of the big role assessment plays in Education. 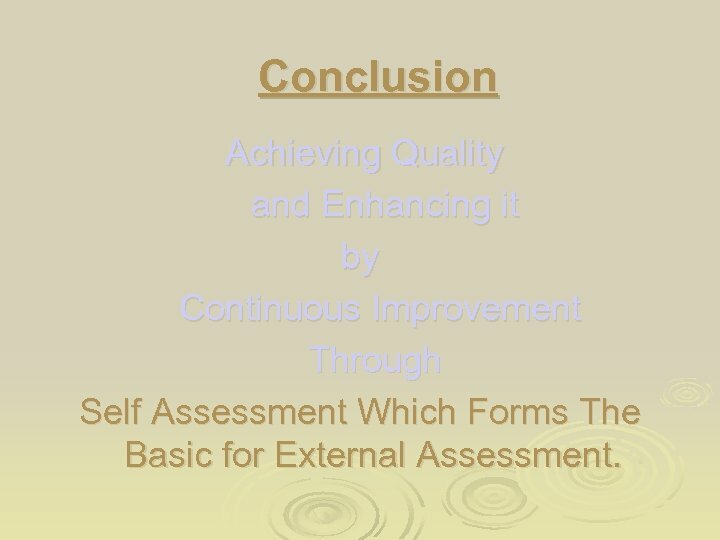 Conclusion Achieving Quality and Enhancing it by Continuous Improvement Through Self Assessment Which Forms The Basic for External Assessment.